In an interview published by "Izvestia" in its 5 December issue, Andrei Tarkovsky Jr. announces the first ever Russian edition of Martyrolog. Despite the availability of Tarkovsky's diaries in translations into 15 languages, the original text had not been published until now. The edition was prepared in Italy by the International Tarkovsky Insitute and sponsored in part by the Russian division of one of Italian banks. The entire printing (5,000 copies) will be shipped to Russia in January 2008 for sale there. We'll post more information on the availability of this edition as soon as we have more details. In today's edition of "Izvestia" (10 December) we've also found an unrelated but interesting interview with Tonino Guerra (in Russian). The opening of the exhibition Bright Bright Day, Polaroids by Andrey Tarkovsky will take place at White Space Gallery, St Peter's church, Vere Street, London W1G ODQ, on Wednesday 21 November. There will be a panel discussion 6 pm, followed by the opening reception 7–9 pm. Additional information may be found here (PDF) as well as on the official website of the companion book, brightbrightday.com. 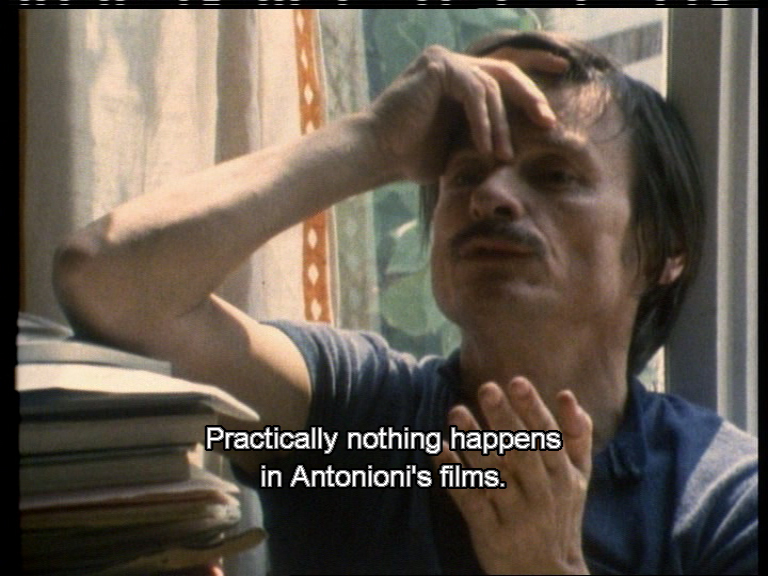 The ambitious U.K. Tarkovsky Festival is fast approaching. In addition to screenings of Tarkovsky's works, several actors and crew will be attending to speak about their experiences working with Tarkovsky. There will be an exhibition of Tarkovsky's polaroids, a live reading of a play dedicated to Sacrifice, and Marina Tarkovskaya will be present to speak about her brother Andrei and her father Arseny Tarkovsky. For more information, see the festival website and the press release (PDF). The project was conceived and initiated by Layla Alexander-Garrett. The event is sponsored by Russian Act, whose festival coverage is located here. Russia IC has some related news here. Marina Tarkovskaja's book Oskolki Zerkala is now available in Swedish. See the publisher's website, and the SvD review. Dominic Michael Rainsford's article Tarkovsky and Levinas: Cuts, Mirrors, Triangulations is available online (PDF format). The bibliographic reference is Film-Philosophy, vol 11, no. 2, pp. 122–143, August 2007. 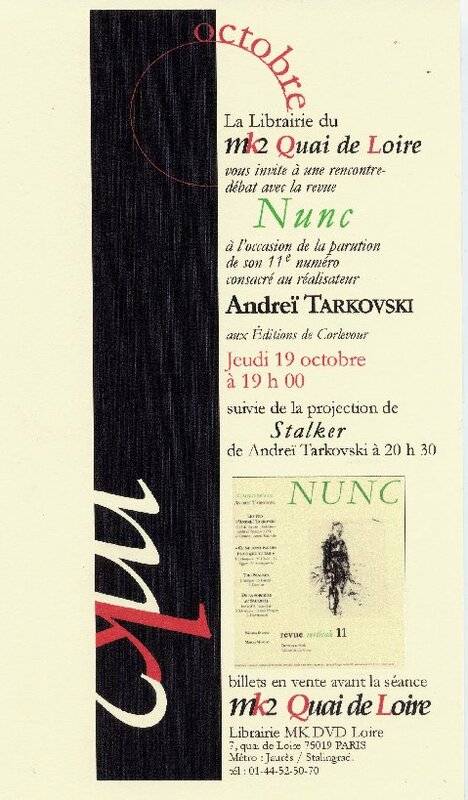 The Friends of the Tarkovski Institute invite you to a "screening-meeting" of Tempo di Viaggio in Paris, on October 24, 2007. Full details here. Stalker will be shown at the National Gallery of Art in Washington, DC, on September 15, 2007 as a part of Film Series Journey through the Russian Fantastik. More information is available here. Thanks to Mario Pascalev for the heads-up. Bernie Beck of El Sobrante, California called our attention to the recent death of Mikhail Kononov, who played Foma in Andrei Rublev. Read obituaries here and here. Site visitor Andre Newell of Australia informs us that Andrei Rublev has been released on DVD in that region, as of Monday September 3. It is a 2-disc edition released by Shock as part of their Distinction Series (as was the case for the previously released Mirror, Stalker, Ivan's Childhood and Solaris). 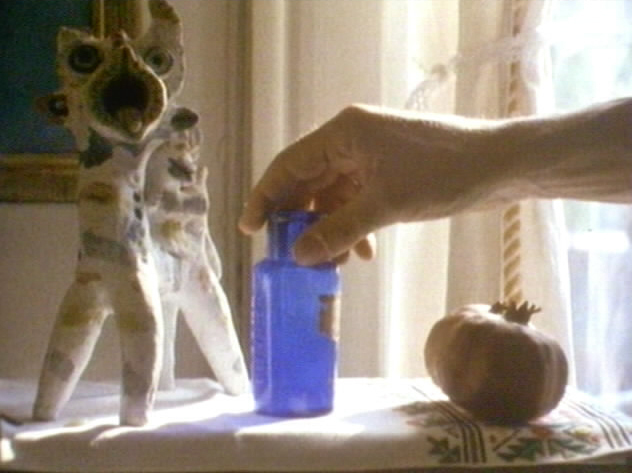 Regarding the Moskwood DVD (PAL) of Nostalghia, Jacob Dijkstra hs made some scene comparisons and reports that the DVD appears to be largely a direct port of the old Fox Lorber edition. The aspect ratio and colors are the same, it is non-anamorphic and the duration is identical to that of the Fox Lorber (NTSC). Subtitles are in Dutch only. Sound is Russian or Italian (both Stereo & DD5.1). As described in our March 9, 2003 news update the Artificial Eye version had several problems pertaining to the soundtrack [ sample ]. Jacob describes the Moskwood audio as being somewhat cleaner, as compared to the Fox Lorber and Artificial Eye versions, in that there is no longer an abundance of crackles and pops. However, the audio is far from perfect, as demonstrated by this audio clip taken from the first minute of the Dutch DVD. The included short film has English subtitles that cannot be turned off. More details on this short is found here. Short season (Solaris, Stalker, Andrei Rublev, Mirror) at the Barbican in London, with one showing each Sunday in October. See the Barbican website for more details. Thanks to David Maguire for the heads-up. Tarkovski. Mémoire de Maitrise. Montréal. Université de Montréal. Some of our readers may not yet have seen this interview with Giuseppe Lanci from November 30, 2001. Thanks to Conrad Steeves for the pointer. combining seven major films of Tarkovsky from Ivan's Childhood to Sacrifice in June, 2001.
and we remembered again Tarkovsky in his death anniversary 29 December, 2006 with three of his films. his diction, his cinematic concern and mostly his heart bleeding cry for mankind. Thanks for organizing a resourceful website dedicating our beloved film maker. 63, Jamal Khan, Chittagong, Bangladesh. contemporary electronic music, electro-acoustic sound and field recordings. really deserves your attention as work of this calibre is something to savour. We have a handful of these disks — which include liner notes by mastersofcinema.org's own Doug Cummings — here at newsdesk and wish to give them away to the first person to write us from each of the Earth's continents. We ask for a brief email wherein they tell us a bit about their tastes not only in film, but also in music (to help us expand our own horizons, if nothing else). Speaking of and-oar.org, be sure to check out the film project Hashima, Japan 2002 on the CM Von Hausswolff & Thomas Nordanstad DVD [ purchasing link ]. On a personal note, if I may, Trond wishes to thank Glenn Kotche — and Jim O'Rourke for arranging it all — for a fantastic time backstage after the recent Edmonton Wilco show. Check out Glenn's page here, and try to catch his upcoming shows with the Kronos Quartet. The Summer 2007 news update from Les Amis de l'Institut Andreï Tarkovski can be found here [PDF format]. 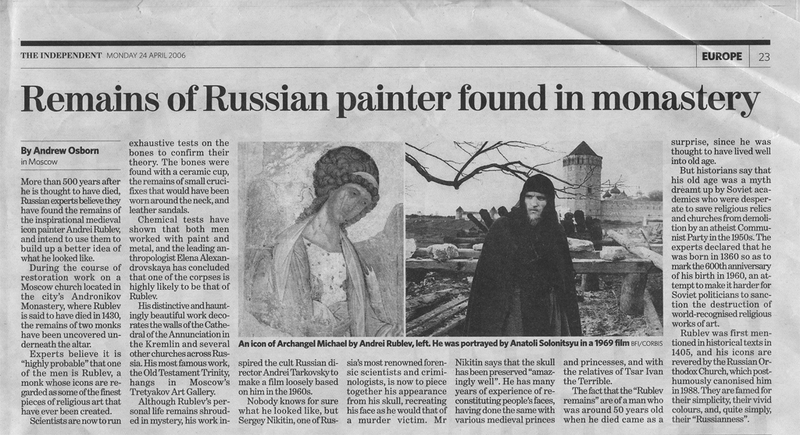 It is presented in the English language, and contains interesting information on the restoration work to be done to Andrei Rublev, as well as information on upcoming music and theater projects, as well as books, festivals, and exhibitions. It would appear that a Russian translation of the Diaries is finally coming out. Let us hope this version is more definitive than the (somewhat less-than-definitive) "definitive" Italian and French versions (see our earlier brief analysis). The (long-awaited) Dutch DVD-version of Nostalghia is finally being released by Moskwood Media. Details here. It includes the 15-min short Andrey by Narine Mkrtchian and Arsen Azatian. Thanks to Jacob Dijkstra for the information. The latest New Brunswick Filmmakers' Co-operative newsletter includes an interview with Owe Svensson about his work on The Sacrifice. The interview is reprinted from Sven E. Carlsson's excellent FilmSound.org. Thanks to Conrad Steeves for the pointer. Site visitor Charles Tyler informs us that Stalker is playing at the National Gallery of Art in Washington DC, September 15th at 2:30pm. More information here. 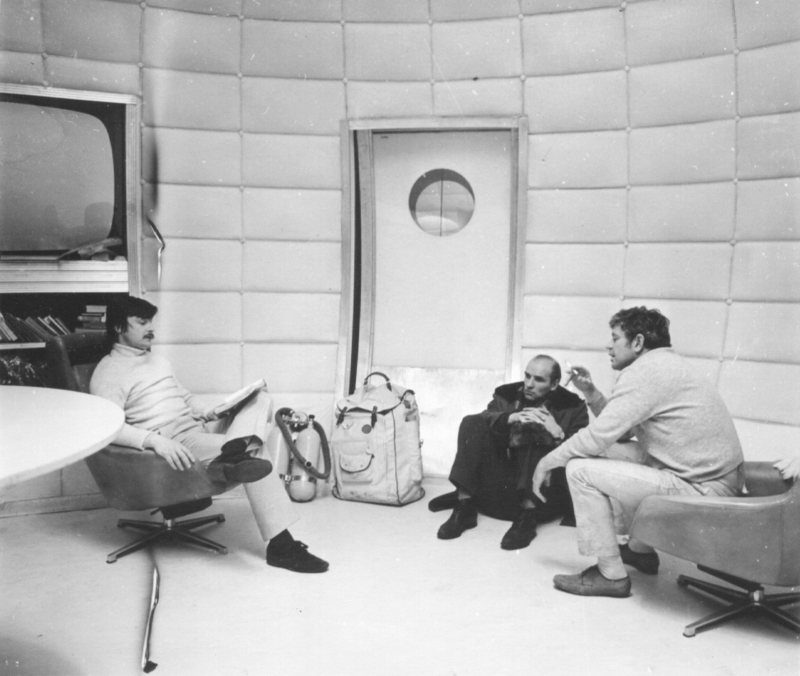 One of the favorite hangouts of your webmasters, the Pacific Film Archive, Berkeley, is screening Solaris and Stalker on August 26 and 14, respectively. Their website is here. Shock Records in Australia released Stalker on DVD under their Distinction Series label on July 2. Details here. Thanks to Matt Lee for the information. Screengrabs from the earlier Distinction Series releases, Mirror and Ivan's, can be found by scrolling down this page. DVDBeaver has compared the Criterion and MK2 version of Ivan's Childhood. Criterion appears superior to MK2. It also appears very similar to the Australian release (not included in the DVDBeaver comparison, but see link in the previous paragraph). Some new photos of Tarkovsky's house in Myasnoe have been posted here. 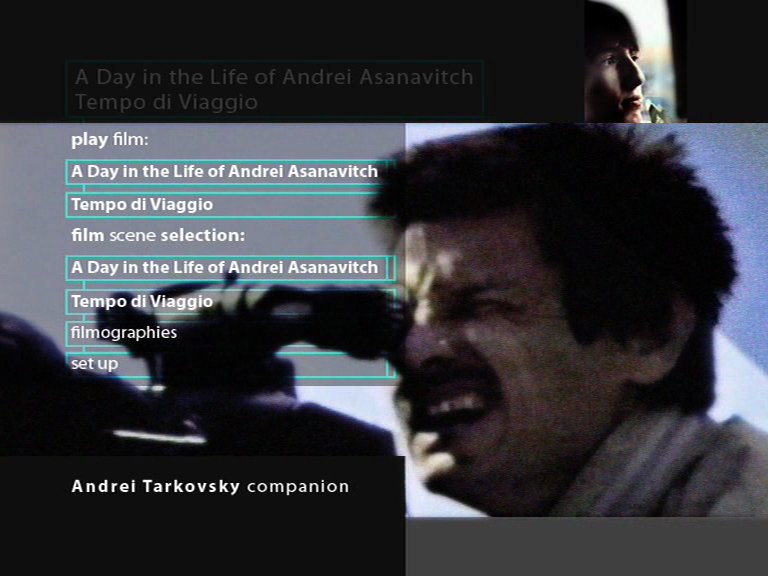 Artificial Eye confirms that the version of Tempo di viaggio included on the Andrei Tarkovsky Companion DVD (see yesterday's news update) does indeed contain new, improved subtitles. Says AE, "[We] did refer to our previous correspondence regarding the subtitles for Tempo di Viaggio and they are now in much better shape." And, indeed they are! Compare for example this framegrab, taken from the first AE issue of Tempo (on their 2003 Nostalghia disc set), to this framegrab, taken from the recent release. 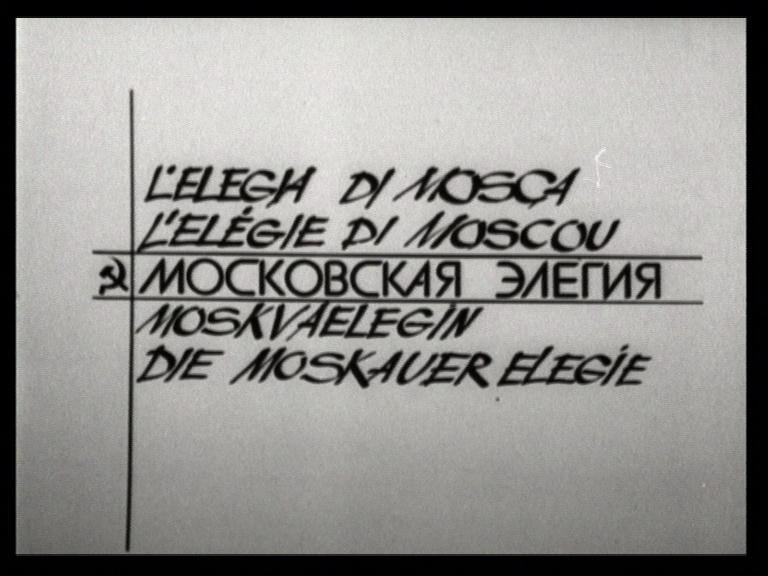 AE has already corrected the Arsanavitch typo seen in the initial pressing — all subsequent runs of the disc look like this. screengrabs for your perusal. Both discs are single layer DVD-5 discs. (progressive) both look like old transfers from exising videotape sources. version on AEs Nostalghia. Hope this is of some interest. 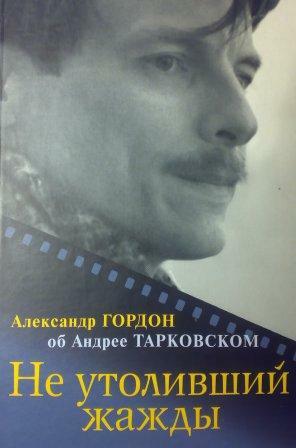 We haven't yet received the Andrei Tarkovsky Companion DVD at newsdesk. Can someone please confirm whether or not the serious subtitle problems we reported here have finally been rectified with this re-release of Tempo? We worked actively with AE several years ago, helping them fix their error-ridden subtitle file (which they informed us was a mere "scratch" file, which had been accidentally used for the official release. Incredibly, this same "scratch" file was later picked up by Facets for their Region 1 release). About half a year ago, we received the following note from Nathan Dunne. The book he announces now has its own web page. You will undoubtedly be hearing lots more about the upcoming Tate Modern events, as we approach 2008.
which has sustained my interest in Tarkovsky over the last few years. than solely on what may  be deduced academically from his films. London Consortium and we are also currently in negotiation with the London Film School. The book will be published in February 2008 and the conference held in April 2008. 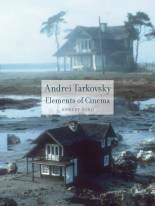 A new book by the excellent Robert Bird is set to be published in the fall: Andrei Tarkovsky — Elements of Cinema. Munkhammar and Bergh's book Tarkovskij — tanken på en hemkomst (Tarkovsky, Thoughts on Homecoming), which has been OOP for several years, has been reissued in what appears to be an expanded edition. The (Swedish-language) book is featured on the publisher's website, here. 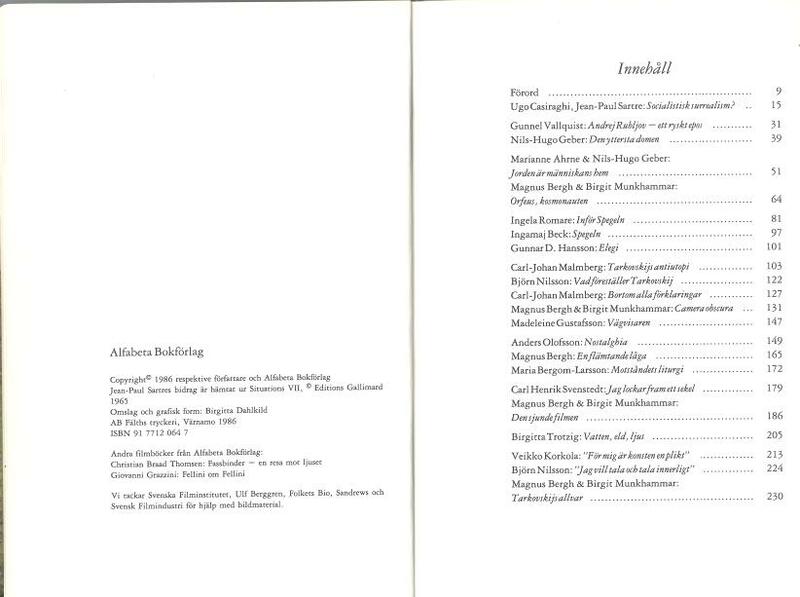 The original edition is in our library (a generous gift from site visitor Johan Anglemark), and its Table of Contents is linked from our Book Bibliography section. Incidentally, this book was prominently referred to by Michal Leszczylowski in his Remembrance — A Year with Andrei. Speaking of Munkhammar, she recently wrote an absolutely amazing review of Gianvito's Interviews. Additional details on the Criterion Edition of Ivan's Childhood (a release which we alluded to in our February 24 news update) may now be found here. The release makes use of the same stellar transfer recently used by mk2. We are disappointed however that the fine There Will Be No Leave Today and some highly relevant documentaries — all of which we provided the original producer (the always enthusiastic Stephanie Friedman, who has since left Criterion) with copies of, several years ago — did not make it onto the disc. We're left with a rather bare-bones and uninspired release. In our opinion, a wasted opportunity. If you already own the mk2 version, there is arguably only one good reason to purchase the Criterion edition: namely, Robert Bird's first-class translation of Between Two Films, Andrei Tarkovsky's own essay about Ivan's Childhood, contained in the DVD booklet (or simply read it here and save your money for the upcoming Woman in the Dunes, one of Tarkovsky's top ten movies). An mp3 file containing an interview given by George Agathonikiadis to the Czech Radio CRo3 Vltava is found here. The interview is perhaps not overly informative, but there is one interesting, almost cute, story buried inside: Agathonikiadis, who was in the process of collecting materials for his film (see our February 24 update), one day suddenly woke up at three o'clock in the morning. As he couldn't fall asleep again, he turned on his TV set. At that precise moment, an old lady on the screen said: "By the way, I was a classmate of Andrei Tarkovsky...".. The old lady was none other than Marika Beiku (see, e.g., Student Years). Says Agathonikiadis, "In my opinion, Andrei himself from Heaven arranged this event!". Thanks to Michal Petricek for the link and for relating the story to us. The Czech DVD version of Solaris is slated for a May 31 release. More details over at Nostalghia.cz. We're happy to see that the original mono soundtrack is included. Among the extensive filmographies and biographies, there is a photo of Fridrih Gorenshteyn included, not found on the previous RusCiCo editions. Czech subtitles carefully crafted by Michal Petricek, as usual. 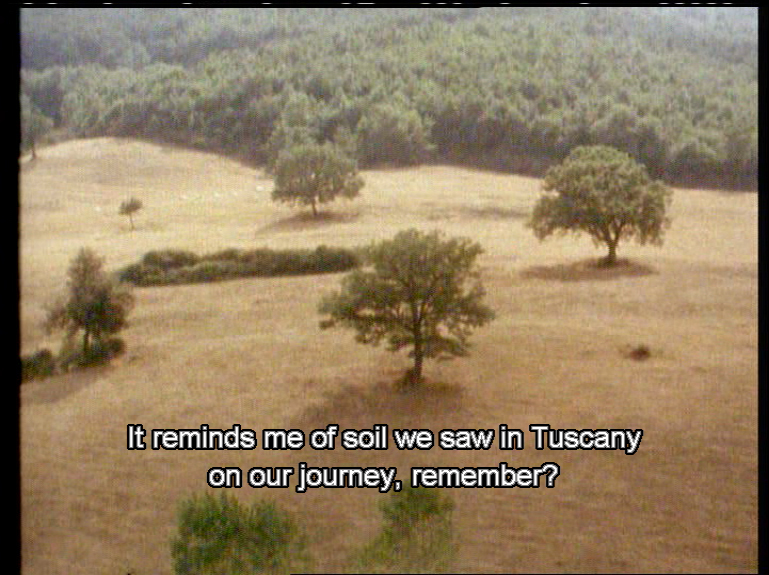 Petr at Nostalghia.cz recently posted a review of the Karmen video release of Tarkovsky's student films (see our December 21 update), featuring a telling framegrab comparison. live sound by Luca Bergero e Luca Sigurtà. This work is inspired by "The Zone". 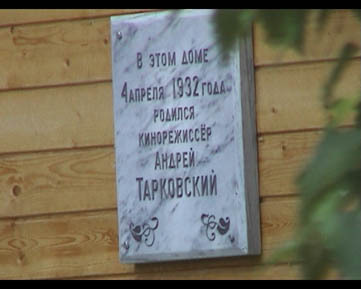 A Tarkovsky Film Festival will be held in Ivanovo, Russia in July 2007. For more information, refer to their website. April 4th was what would have been Andrei Tarkovsky's 75th birthday. Yevgeny Borzov in Ivanovo submitted the following report. Alexander Sokurov and Oleg Yankovsky. Banionis,Otar Iosiliani and Andrey Tarkovsky Jr.
famous producer. The local authorities, including Mr.
memorial ceremony at the Tarkovsky Museum on April 3d. friendship with Andrey over more than 20 years. including Magnetism of Memory by Yevgeny Borzov. — 11, 2007 at   Moscow Central Museum of Cinema. Cinematheque Ontario, Canada, is screening Solaris on March 12, and Stalker on March 15. Details here. The local St. Petersburg TV station STO appears to have inadvertently broadcast the rarely-seen and much sought-after "First Cut" (referred to by some as the "Director's Cut") of Solaris. When one shocked Tarkovsky fan called the TV station to ask what it was that he had just watched, they simply did not understand what the fuss was all about. See the interesting debate here [English translation via Babel Fish]. Thanks to Michal Petricek for the tip. 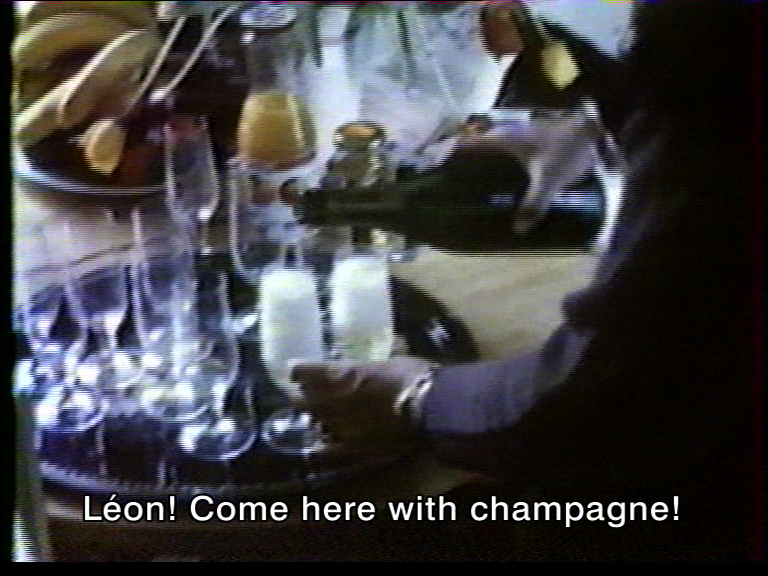 A few scenes from this cut can be seen on the Criterion DVD—see our earlier interview with the Criterion producers. movie site about a filmmaker, if some day it exists. at the Cinémathèque française, Alexander Sokurov. one, and we are incredibly lucky to get it in Paris. "télécharger le programme du festival". used to be, and one cannot expect a really good "film atmosphere" going there. 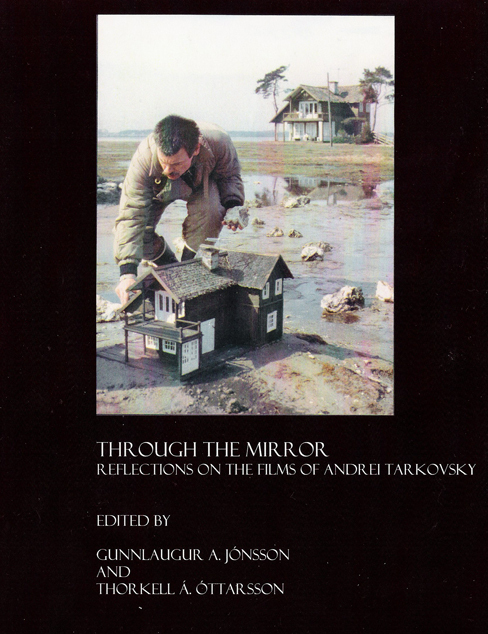 The much-anticipated new book Through the Mirror: Reflections on the films of Andrei Tarkovsky edited by Gunnlaugur Jónsson and Thorkell Águst Óttarsson (see our April 14, 2006 update) has finally arrived. The book's Table of Contents and Introduction can be read here [PDF]. The front matter can be viewed here. The book may be purchased directly from the publisher, or from amazon. The book's dust jacket features an excerpt from our forthcoming Nostalghia.com review of the book: "As the editors rightly state, little analysis has been leveled at the rich religious motifs and quotations within Tarkovsky's films... This compilation is therefore welcome for its focus as well as its approach; avoiding the extremes of pat reductionism or whimsical analysis, the various authors here strike a compelling pose between cinematic and theological scholarship and a respect for ambiguity and multiple interpretations. The writing is serious yet accessible...". Full review to follow shortly. Julia Kristanciuk writes: "[...] I got a chance to fly to Moscow this past January and take some pictures that may be of interest to the fans of Andrey Tarkovsky. One picture [ photo i ] is of one of Romadin's sketches for Tarkovsky's Solaris (is was exhibited in one of the halls at Mosfilm); the other two pictures [ photo ii | photo iii ] are of the place where Tarkovsky's house used to stand (now the house is completely demolished—the sign at the site says that the house will be re-built); two more pictures [ photo iv | photo v ] are of certificates of participation of Tarkovsky's films in two film festivals (these, too, are exhibited at Mosfilm)." 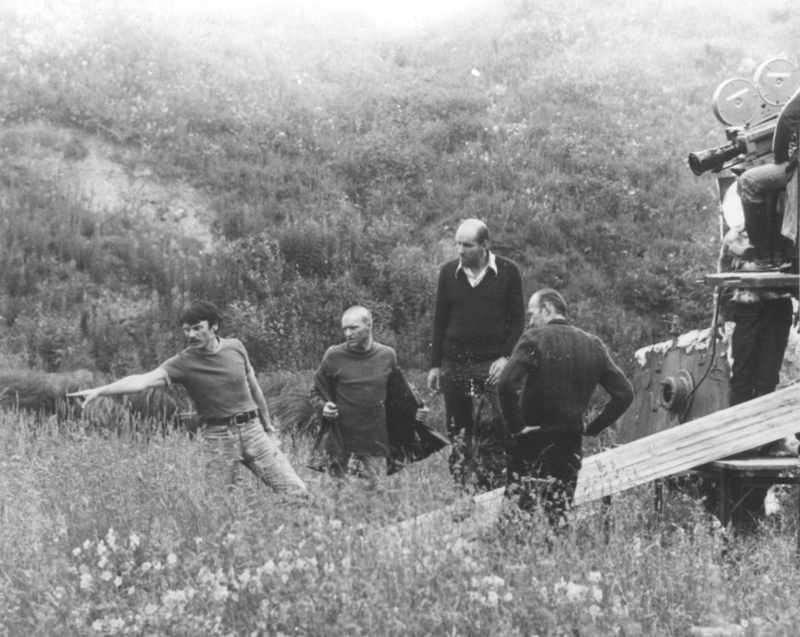 Petr Gajdosík, curator of our sister site Nostalghia.cz, informs us of a handful of new articles recently posted on his site, all in the Czech language: (a) a gallery of curiosities and bloopers of various kinds spotted in Tarkovsky's films, here. An English translation will appear on Nostalghia.com by the next news update. (b) a gallery of paintings seen in Tarkovsky's films with relevant screenshots and comments about the painters here. (c) a review of the recent Gianvito book, here. (d) a review of the Synessios book, here. (e) a review of the film Posle Tarkovskogo by P. Sepotinik, here. 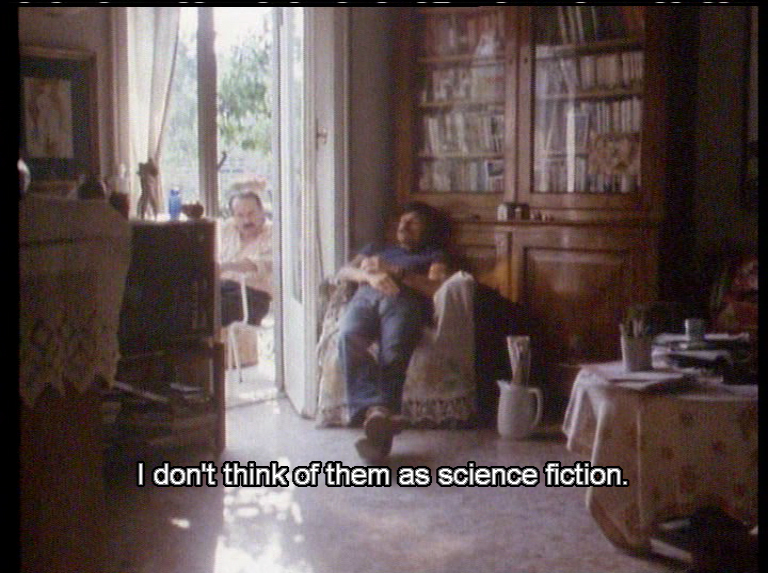 In other news, George Agathonikiadis's film about Tarkovsky, Memories of Andrei Tarkovsky (a project we mentioned here on August 19, 2003), had its (world) premiere on Czech TV Canal CT 2 on February 11, 2007 at 20:15 CET. 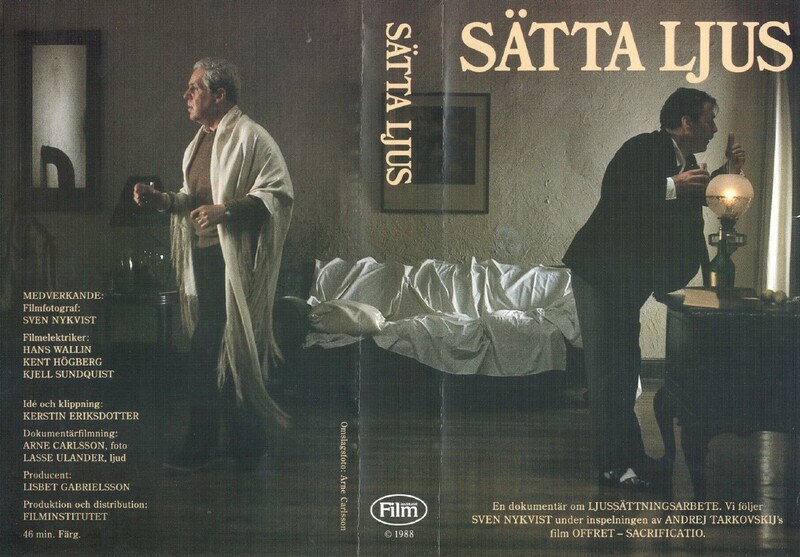 Finally, Petr also informs us that a Czech DVD release of Solaris is imminent. 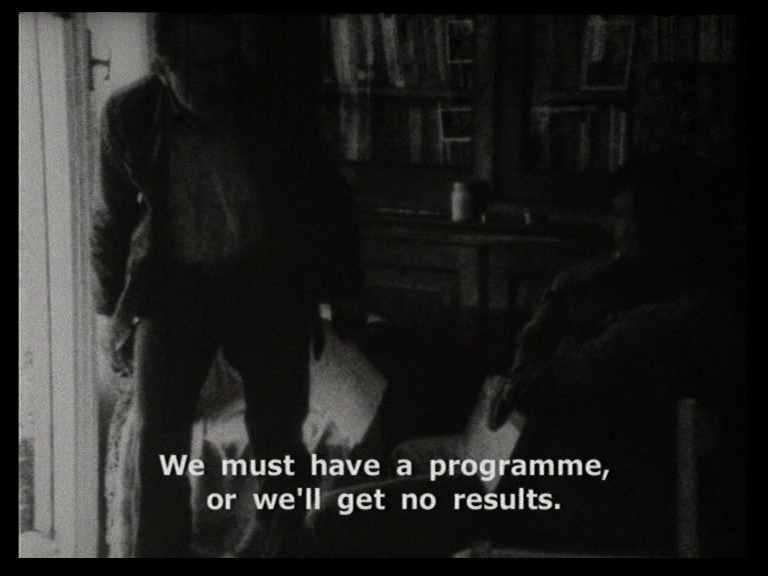 Czech subtitles lovingly crafted by Michal Petricek, as usual. Michal Petricek sent us a brief snippet from the Czech TV broadcast of Agathonikiadis's film, featuring Margarita Terekhova: video [.avi] / English subtitles [.sub]. asked him how SOLARIS' black and white scenes and video screens should look. shot only in one single take due to the shortage. 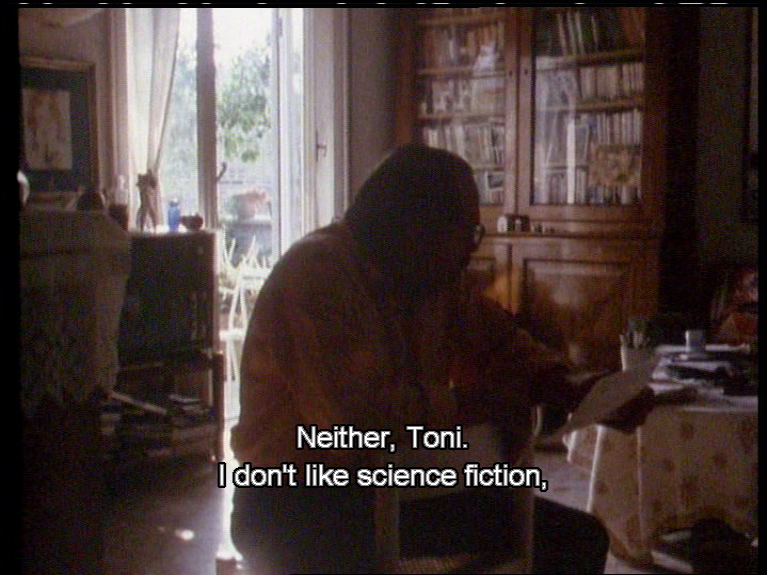 He said that he was very fond to have worked with Tarkovsky [...]. 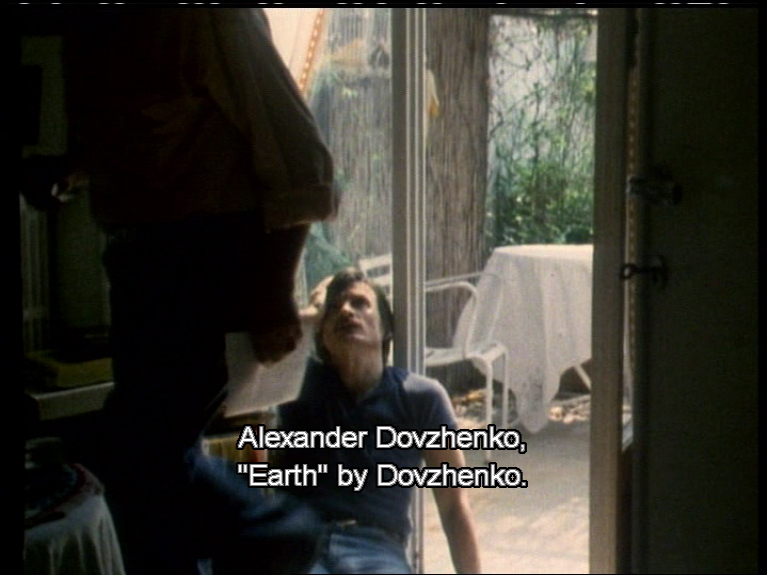 version is more faithful to Tarkovsky/Yusov's intentions in that regard. We note that the above contradicts Criterion's own (widely quoted) statements (see also our December 11, 2002 update) on the topic. All we can do is admonish future DVD producers to take careful note of Yusov's statements, as reproduced above, and proceed accordingly. Ivan's Childhood is finally coming to DVD NTSC Region 1. Those who were planning to spend their hard-earned money on an alt-region release may wish to hold off, in anticipation of the Criterion Edition, to be released "this summer". Site visitors Jon Lynden (U.K.) and Gregory Young (Australia) both submitted excellent scans of a complete set of Solaris "Front of House cards". They may be viewed here. Tarkovsky fans in Romania are reportedly ecstatic over the recent release of Nostalghia on DVD in that country. Meanwhile, a posting to the Forum MK2, evidently from MK2 itself, states that their Nostalghia DVD release has been cancelled because of a problem with the legal rights to the title. Thanks to Wayne Spencer for the pointer. That there are indeed serious rights' difficulties surrounding this title is confirmed by what James Quandt related to us a while back: "NOSTALGHIA, which I tried desperately to get a new print made of for our retro, and spent months going round in circles with the Italian rightsholders, etc., was shown in a print cannibalized from some old prints and with no rights." 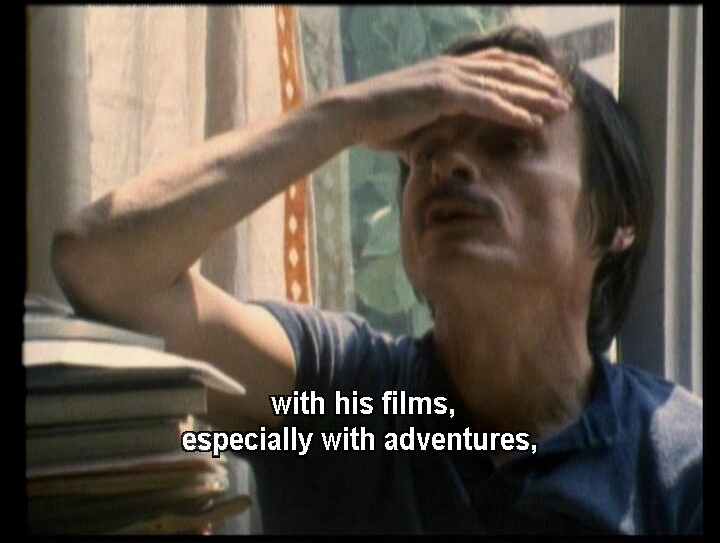 Artificial Eye's Tarkovsky Companion DVD is now scheduled for a May 28 release. OK. Your Nostalghia.com editors have been wondering/arguing for years over what on earth this is. We are referring to the rather attractive figurine seen in the framegrab (detail seen on the right), taken from Tempo di Viaggio. The reader who can tell us something definitive about this work of art will be rewarded with a gift. Who owns psychokitty now, and where can she be viewed up close... or would the owner even be willing to sell her to us!? She would fit perfectly into the overall milieu here at editorial headquarters. Eugene Borzov informs us that his film Magnetism of Memory (see our October 22, 2006 update) is participating in the Spanish Documentary Film Festival Punto de Vista (Navarra International Film Festival, February 23 to March 3, 2007, see also our December 21 update). The rather impressive lineup is found on the Festival website, and we have preserved a snapshot of it locally (here), for posterity. Paradjanov: The Last Spring is having its Spanish premiere at the Navarra International Film Festival, during the Dear Andrei documentary retrospective. Marina Tarkovskaya and Alexander Gordon will be attending the screening of the film, which will be introduced by Mikhail Vartanov. Furthermore, Paradjanov: The Last Spring will have its French premiere on March 10 at 1900h at Magic Cinema's Theatres au Cinema Film Festival in Bobigny, France, where Mikhail Vardanov will again introduce the film. His introduction, as well as his visit to the cemetery where Tarkovsky is buried, will be filmed. The hauntingly beautiful François Couturier Nostalghia CD continues to create quite a bit of stir in Tarkovsky circles. Here is the pamphlet [PDF] from the recent event in München, Germany. From YouTube: Tarkovsky on Cinema | Tarkovsky on Art I | Tarkovsky on Art II. We have finally posted our article The Japanese Betrayal, which we wrote half a decade ago — it's probably worth getting it out there in spite of that one missing bibliographical reference right at the end, which we never were able to locate. Filmmaker, curator, and author John Gianvito will speak about his new book, Andrei Tarkovsky: Interviews and introduce a screening of Tarkovsky's Voyage in Time on Thursday, January 25, 2007, at 8 pm. The location is Studio Soto, 63 Melcher St., Boston, telephone 1-617-426-76786. More information here. Those who wish to purchase Gianvito's excellent book from Amazon.com may use this link (paperback) or this link (hardcover) to support our friends over at DVDBeaver in the process. The book comprises an invaluable collection of interviews, many for the first time in English. Along with Sculpting in Time, this book may safely be considered a must-have for all English-speaking Tarkovsky aficionados. Istituto Internazionale Andrej Tarkovskij, Firenze, Italia, has provided us with this announcement [PDF], on a (traveling?) photographic exhibition dedicated to Mirror. The Metro Cinema, Edmonton, Alberta, Canada will be screening a new print of Stalker on the Feb 17–18 weekend, as part of From the Tsars to the Stars, the traveling exhibition of Russian sci-fi films from the 1920s to 2006. Their website will be updated shortly with the exact screening time(s). 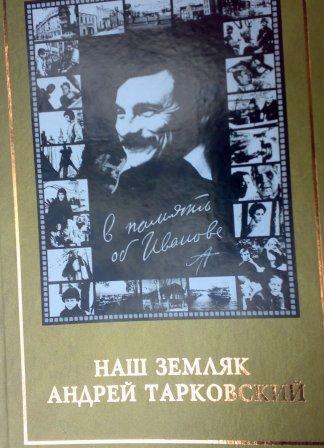 Many thanks for your GREAT web site on the life's work of Mr. Andrei Tarkovsky. Ryland Knight has written a review of Béla Tarr's Sátántangó for Matt Zoller Seitz's The House Next Door, wherein he references Tarkovsky (as well as our site). Read it here. A Merry Christmas and a Happy Prosperous New Year to you from Trond and Jan at Nostalghia.com. With deep appreciation we thank you all, especially those that tossed us contributions, complaints and suggestions. What follows is the last news update of 2006. Enjoy, and keep in touch. We need you. Istituto Internazionale Andrej Tarkovskij, Firenze, Italia, has provided us with this announcement [PDF], describing upcoming Tarkovsky-related events. UPDATE: Several exciting events in Firenze on December 29 — invitation here. 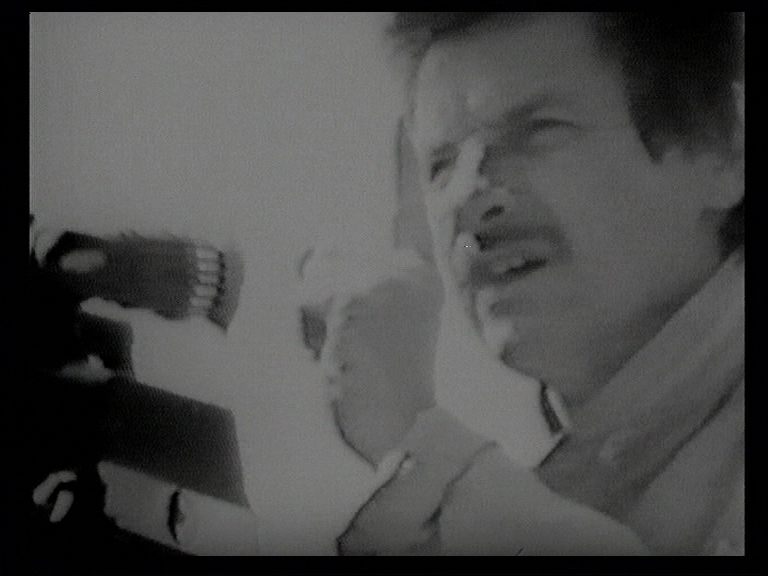 Karmen Video has released some early films of Andrei Tarkovsky and other Russian directors, in the form of a 4xDVD set. Vol. 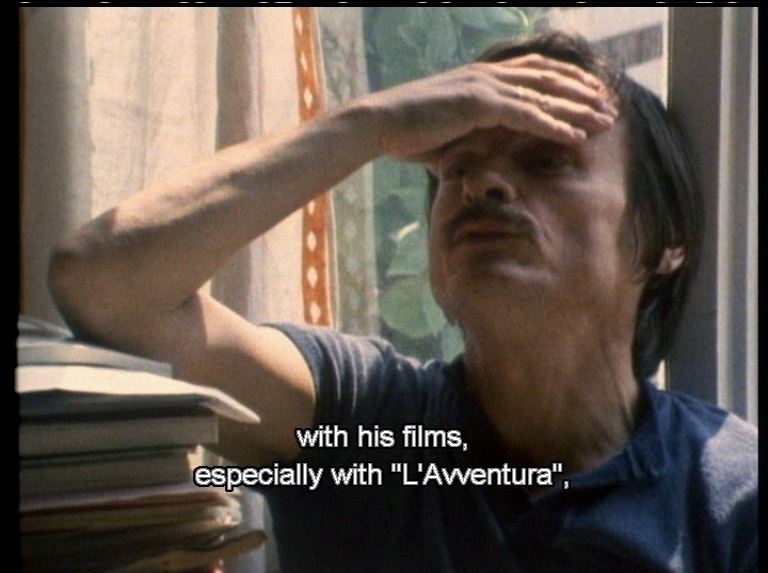 1 includes The Steamroller and the Violin (Tarkovsky), The Killers (Tarkovsky et al. ), Iz Lebyazhego soobshchayut (Vasili Shukshin) and The Boy and the Pigeon (Andrei Konchalovsky). Vol. 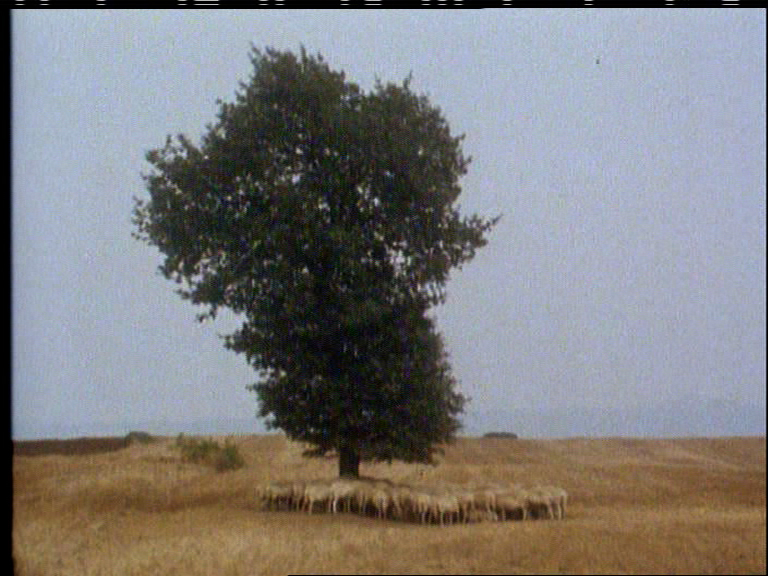 2 includes My Heart Is in the Highlands (Rustam Khamdamov), There Will Be No Leave Today (Tarkovsky et al.) 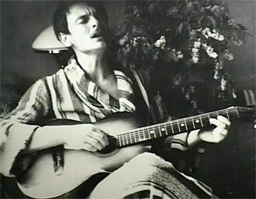 and Aptekarsha (1962, Stanislav Govorukhin). Vol. 3 includes The Groom (Elem Klimov), Look, the Sky! (Elem Klimov), Devochka i veshchi (Nikita Mikhalkov), Nastasiya i Fomka (Nikolai Gubenko) and A Quiet Day During the End of War (Nikita Mikhalkov). Vol. 4 includes Vy chyo, starichyo? 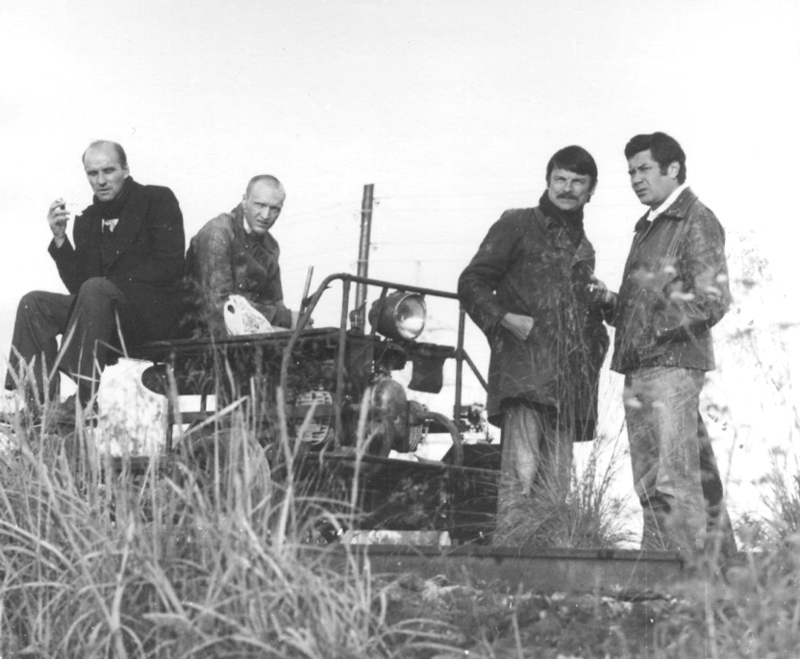 (1982, Vasili Pichul), Razrushitel voln (1989, Ivan Okhlobystin), Son v letnee utro (1989, Fyodor Bondarchuk) and Izmena (1998, Aleksandr Shein). 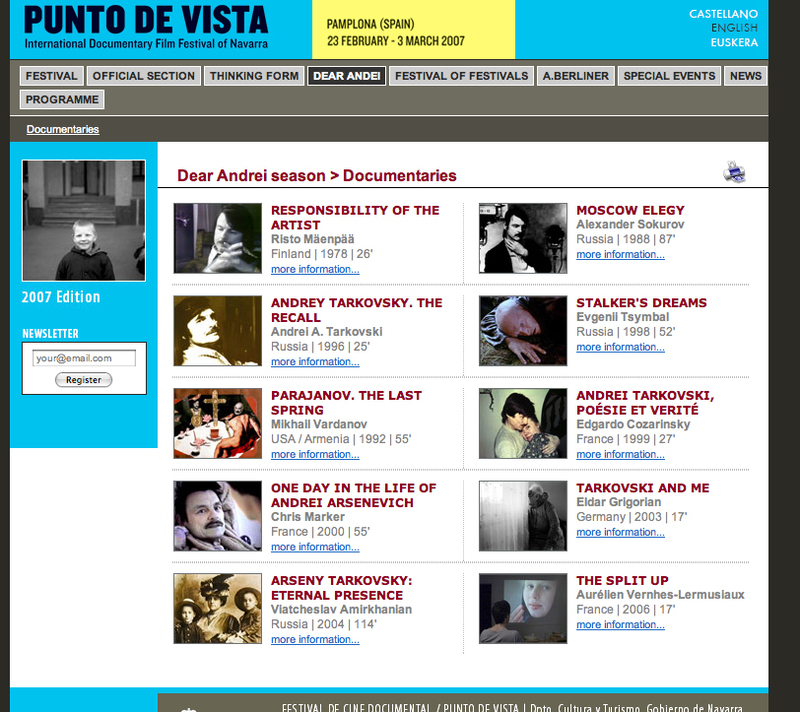 The Spanish Documentary Film Festival Punto de Vista (February 23 to March 3, 2007) will feature a series of Tarkovsky related documentaries. See the programme preview here, and keep an eye on their website for updates. There is a new book out on the excellent EKSMO label: N. Boldyryov's Zhertvoprinoshenie Andreja Tarkovskogo (ISBN 5-9560-0101-1). Additional details here. Site visitor Bernie Beck, of El Sobrante, California pointed us to an article, Memorial tablet to Andrei Tarkovsky Fixed Up in Paris, as well as to a review of the Moscow Elegy DVD, here. Finnish filmmaker Jukka Eronen has made English versions of two of the posters mentioned in our previous update: 1 | 2. The Institut français in London are having a full Tarkovsky retrospective in January 13 – 25. They will be showing all the films, including Steamroller and the Violin, along with Chris' documentary and Norstein's Tale of Tales. Additional details may be found here. 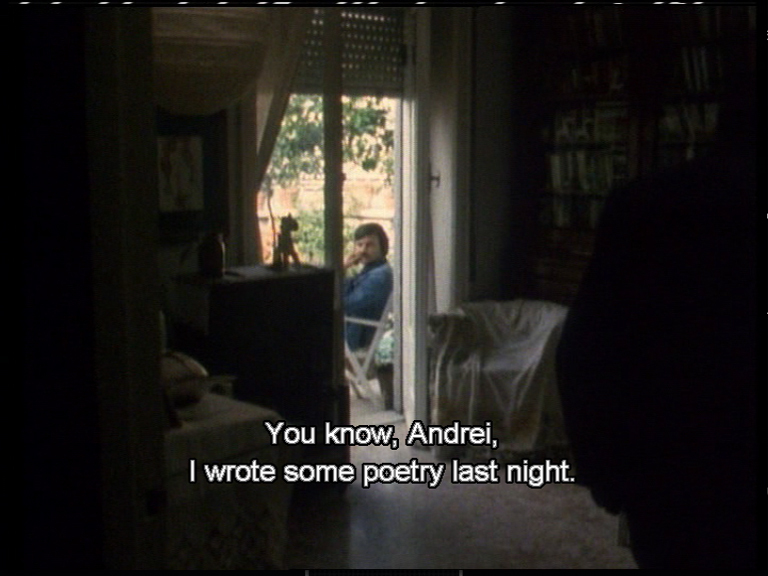 The Renoir Cinema (Brunswick Centre, Russell Square, London) will be showing Solaris on January 7 and One Day in the Life of Andrei Arsenevitch on January 14. For more information contact Simon Howarth on 020 7438 9543 [ website ]. Dan Jones, Graduate Teaching Assistant Coordinator of the School of Interdisciplinary Arts, Ohio University, informs us that he has published an essay about Nostalghia and Feminism in the Winter issue of Cineaste. As far as we can tell, it does not appear to be available in the on-line edition. 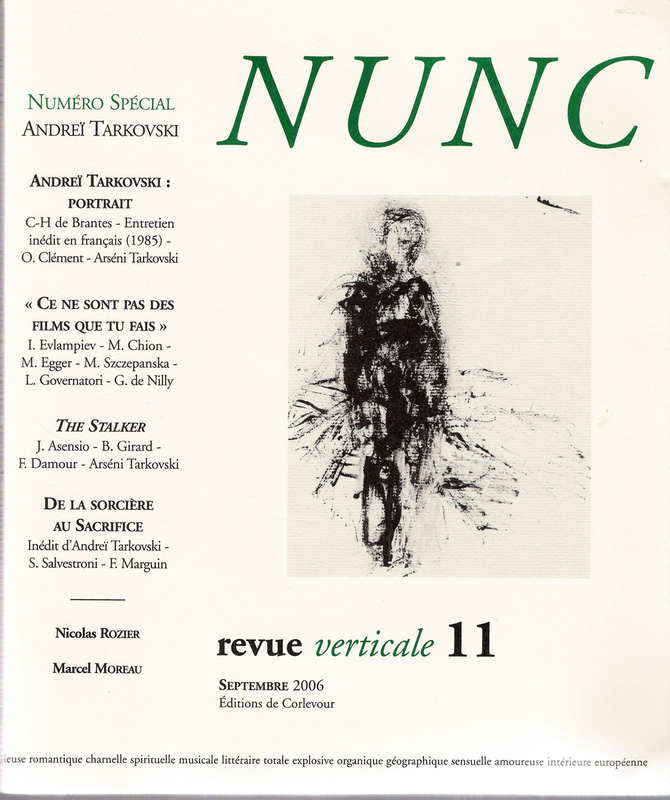 Éditions de Corlevour, France, recently published a special Tarkovsky issue of NUNC revue. The special issue includes articles by young French researchers, who have leaned heavily on the International Institute A. Tarkovski for assistance, along with essays by philosophers, theologians and critics. Also included is the first French translation of the scenario The Witch. Click on the cover scan on the left for a larger version. Here is the Table of Contents and here are the publication data. Incidentally, we're pleased to (finally) see a discussion on how Terrence Malick's Thin Red Line relates to The Sacrifice, an internal pet topic of ours for the past 6 years. An mp3 version of Tarkovsky's by now so famous adaptation of Faulkner's Turnabout is located here (60 MB). Some Russian language skills, and a free (but somewhat complicated) registration process, is required. The documentary film Passion according to Solonitsyn (Strasti po Solonitsynu) recently aired (twice) on satellite TV channel Telekanal Rossia. This is a "must see". Courtesy of Michal Petricek in the Czech Republic, here is a brief snippet [ AVI format ] and Michal's own (home-made) English subtitles [ SUB format ]. And here are a few screengrabs: [ 1 | 2 | 3 | 4 | 5 | 6 | 7 | 8 | 9 | 10 | 11 | 12 ]. Michal is currently in the process of subtitling the entire documentary for us. And this is not the first time he does this for us. What would we do without you, Michal? 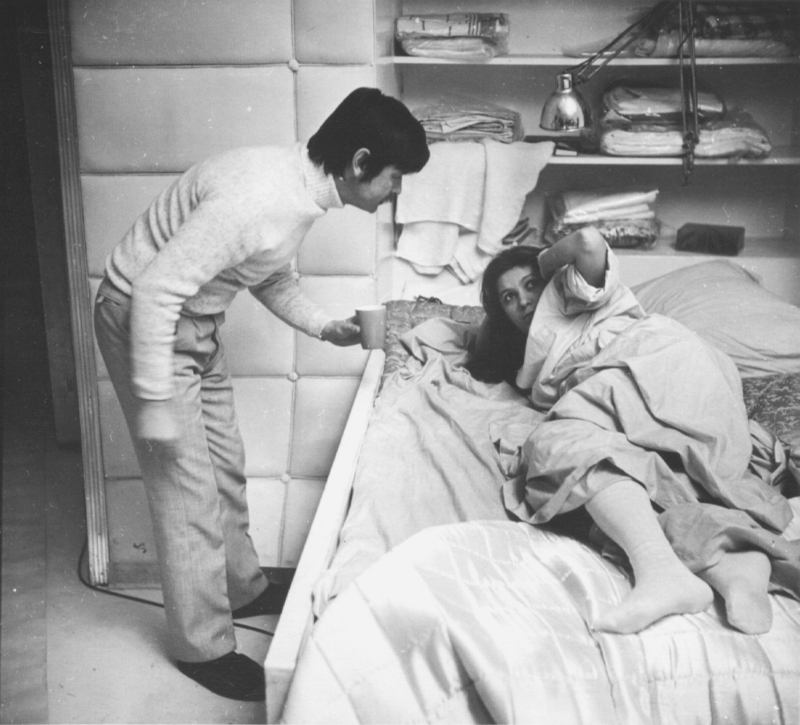 Thirty-five years ago, Tarkovsky shot parts of Solaris in Tokyo. Site visitor Kikutake Yuji of Japan traces his footsteps in this photo gallery. Thank you, Kikutake san! We mentioned the Facets release of Moscow Elegy in our previous news update. Check out the full Ideale Audience news, found here. These are the discs that Facets licences for the U.S. (like the earlier Ideale Audience Sokurov releases). 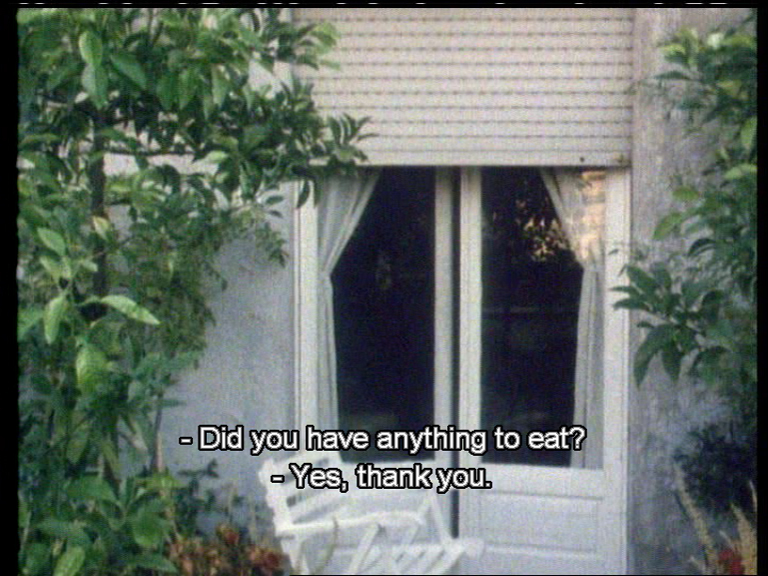 Jonas Mekas, founder of Anthology Film Archives, has outtakes from The Sacrifice available for purchase on his website. At the moment, the outtakes are only available at a resolution of 320x240 (mp4 format) for $3.99, but the site does state that they will also be available in a 720x480 resolution, for $6.99. Thanks to Matt Clarke for this information. As pointed out in our September 16 mastersofcinema.org update, Mekas' website comes highly recommended as it features some of his own films as well as (in the future) short films made by directors such as Scorsese, Jim Jarmusch, John Waters, Peter Bogdanovich, Ferrara, Wim Wenders, Mike Leigh, Virginie Marchand. The Second Editon of Rafael Llano's Andrei Tarkovski, Vida y Obra (Andrei Tarkovski, Work and Life) is now available, published by The Instituto Valencia de Cinematografía Muñoz Suay (Valencia, Spain). The book, consisting of two volumes and almost 900 pages, won the Prize for Best Literary Contribution to Cinema in 2003, awarded by the Spanish Association of Film Critics (CEC, Madrid). It sold out almost immediately after its initial release. Rafael Llano is professor at the Mass Media Institute of University Complutense of Madrid (Spain), and editor of the Spanish web site www.andreitarkovski.org. Solaris, Ivan's Childhood and The Mirror have recently been released on DVD in Australia, by Shock Records. Cover scans and other pertinent technical data may be found here: Solaris | Ivan's Childhood | Mirror. Thanks to Matt Lee for the information. I just saw Konstantin Lopushansky's new film, Ugly Swans (Gadkie lebedy). threat they are considered to pose to the world. any Tarkovsky film, and its overall look is much slicker, without the grittiness of Stalker. if Lopushansky would repeat it or at least refer to it, but I didn't hear any references to it. The December news update from Les Amis de l'Institut Andreï Tarkovski, Paris, can be found here [French, PDF]. 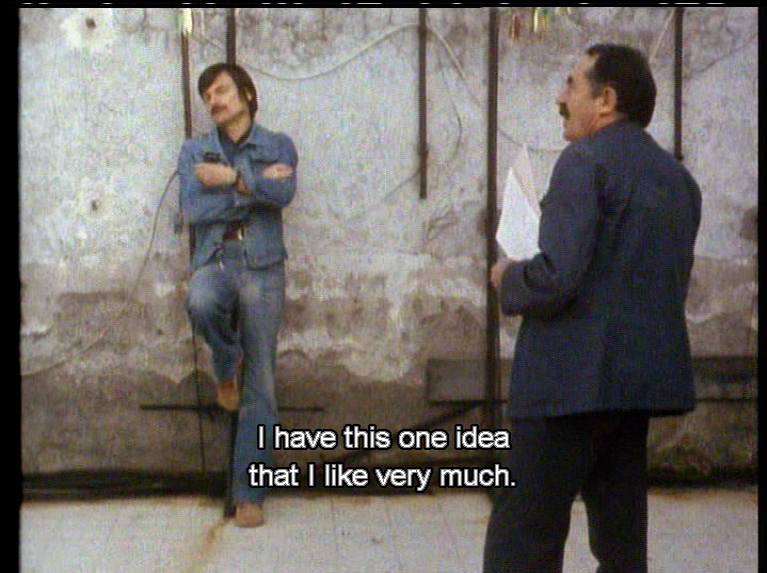 A complete Tarkovsky retrospective is scheduled for December 8 to 13; details here [PDF]. Those who wish to become members of the Les Amis may use this form. Mirror is being released in the Czech Republic shortly. See Nostalghia.cz's November 16 news update here. Cover art here [PDF]. Additional details may be found over at Zona. Some of our readers may be interested in Steven Dillon's new book The Solaris Effect: Art and Artifice in Contemporary American Film (University of Texas Press). Details and a link that leads to, amongst other things, the chapter in the book on Tarkovsky's SOLARIS and the Cinematic Abyss can be found here. Thanks to Wayne Spencer for the tip! Kino has just released Stalker on DVD. Details may be found here. Kino declined our request for a review copy, choosing instead to focus their marketing efforts at the mainstream audiences. You will therefore have to turn to sites such as digitallyobsessed for reviews of this DVD. Facets have announced that they will be releasing Moscow Elegy, Alexander Sokurov's portrait of Tarkovsky, on DVD on 27th December 2006. More information here. Time to throw away that old unsubbed DivX download! There is no sign of Nostalghia on MK2's forthcoming DVD releases page, suggesting that it may have been delayed or even cancelled. We suspect that they — like so many other DVD labels before them — suddenly realized that the quality of the Optical audio track used during mastering is of insufficient quality for a DVD release. (At this time, only we at Nostalghia.com and a few of our well-placed contacts appear to know where a copy of the superior Magnetic track resides). However, MK2 will shortly be releasing Chris Marker's Une journée d'Andrei Arsenevitch as part of a six-DVD set of 18 documentaries called Coffret Cinéma de notre temps. It appears there are no English subtitles. As mentioned before, the new issue of Vertigo magazine (vol 3, no 3) includes an article Stalking The Stalker by James Norton. James kindly provided us with some interesting photos which we have added to our recent reprint of his article, here. Over at greencine, Cory Vielma traces what he sees as the similarities between Stalker and The Wizard of Oz. 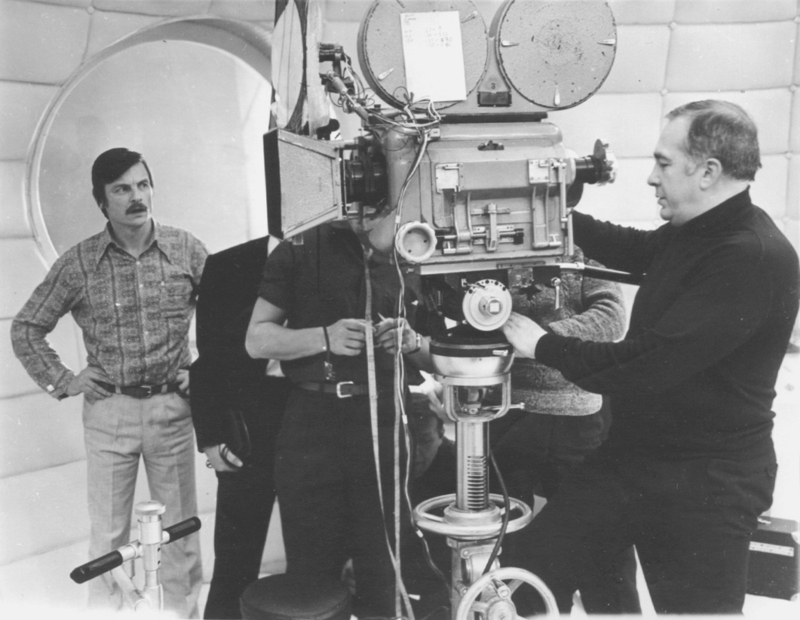 Site visitor Julia Kristanciuk provides this link to a master class that L. Nekhoroshev taught in a workshop at the Mosfilm studio on April 18, 2006. During this lecture, Nekhoroshev reminisces about the times when he discussed Andrey's films with Andrey himself, and he also makes an attempt at analyzing the dramatic development in the narrative of Andrey Rublev. The lecture is in Russian, but we hope to bring you an English transcript shortly. Finnish artist/filmmaker Jukka Eronen provided us with links to a series of beautiful Tarkovsky filmography posters that he designed: 1 | 2 | 3 | 4 | 5. The November news update from Les Amis de l'Institut Andreï Tarkovski, Paris, can be found here [English, PDF]. 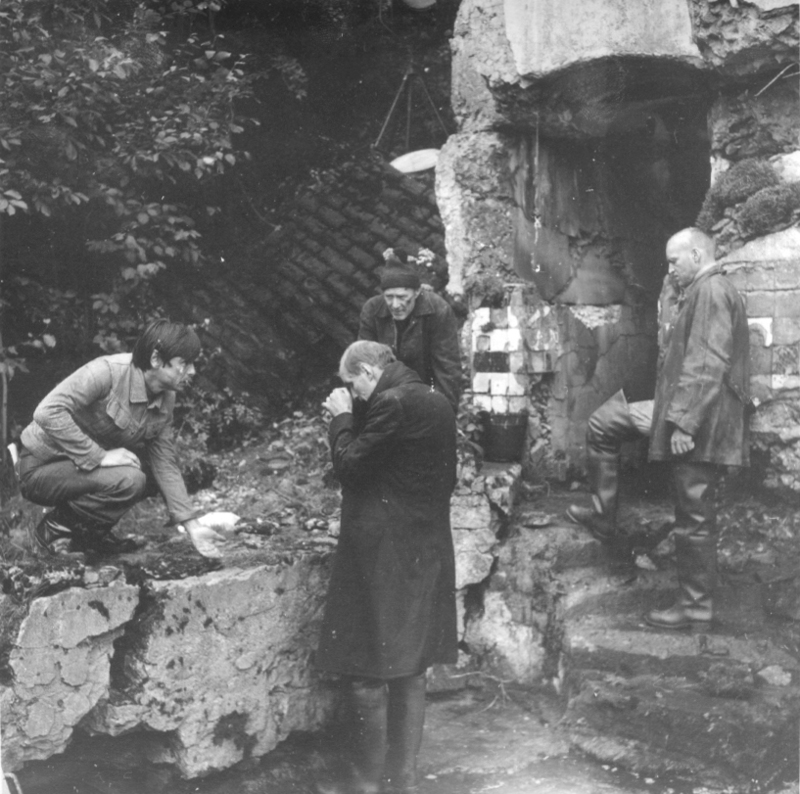 It describes events in connection with the ongoing "Tarkovski en France, 1986–2006" anniversary. 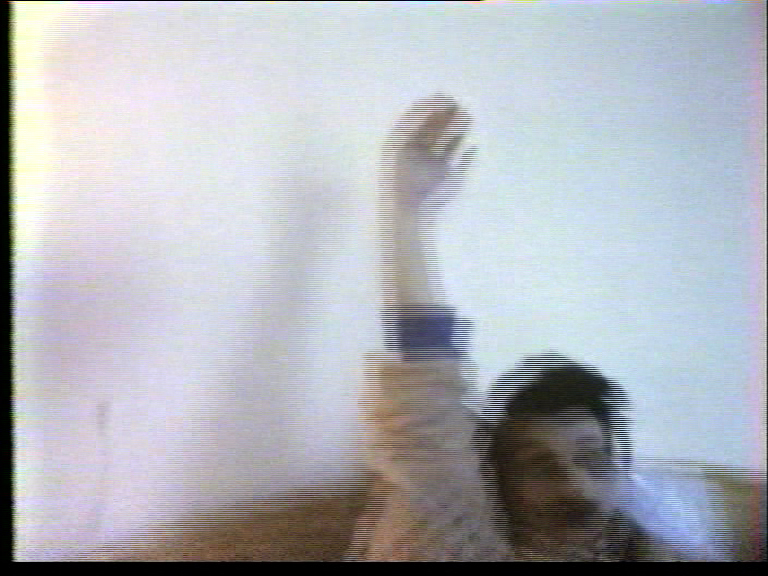 The French National TV Archives have much interesting video material available, free of charge. 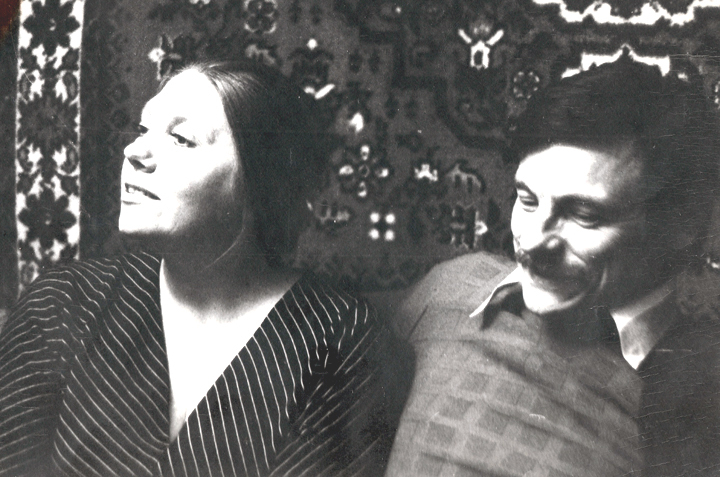 See for example this interview with Tarkovsky and Natalia Bondarchuk, conducted in connection with the receipt of the Grand Prize in Cannes for Solaris. A significant amount of Bresson-related material is also found on this site. Thanks to Michaël Lellouche for the tip. Nostalghia – Song for Tarkovsky has been reviewed by Konrad Heidkamp in the German newspaper Die Zeit. 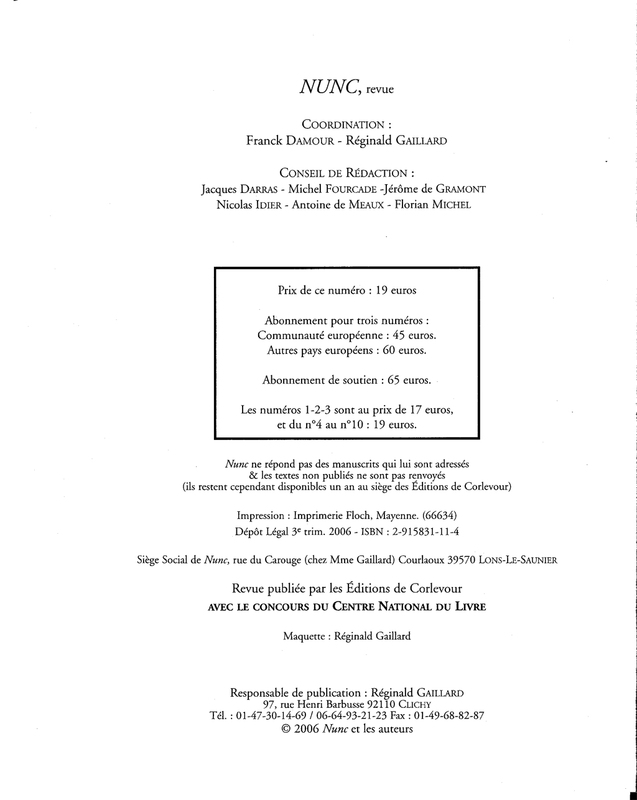 An English translation is provided here [PDF]. Support our favorite DVD-related site, DVDBeaver, by using this link if you wish to purchase the CD. The American Cinematheque is having a Russian Fantastik Cinema series this week at the Egyptian Theatre in Los Angeles, USA. They're showing both Stalker and Solaris. Additional details here. him speaking about his "Mirror"  on the stage in 1976. 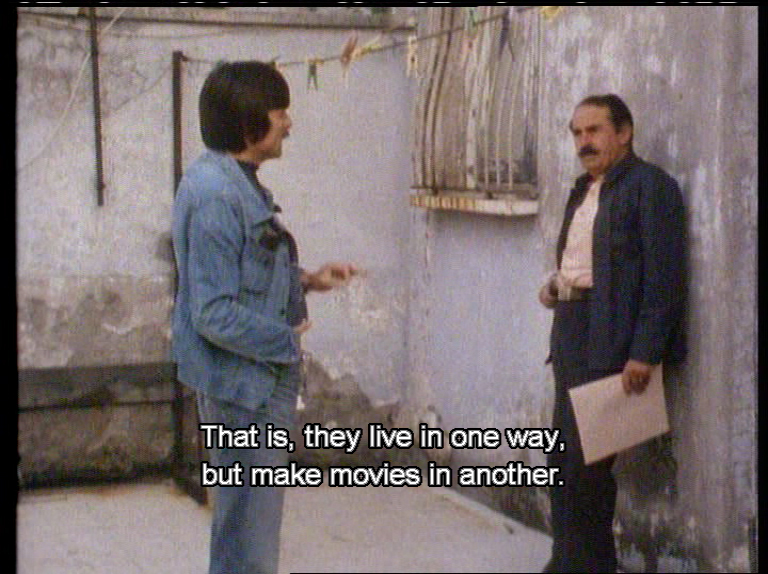 Tarkovsky in 1976 and their attitudes to his legacy. special tribute to Tarkovsky in 2006. Nostalghia – Song for Tarkovsky is the title of a beautiful new CD by the French pianist and composer François Couturier of music inspired by films of Andrei Tarkovsky. The CD (see the cover on the left) was released by ECM Records and is widely available. The soloists are: François Couturier: piano, Anja Lechner: violoncello, Jean-Marc Larché: soprano saxophone, Jean-Louis Matinier: accordion. Click here for the press text. The record is already garnering rave reviews in the French press, see e.g., the Le Monde review. Support our favorite DVD-related site, DVDBeaver, by using this link if you wish to order this CD. James Norton from ITV Network in London sent us an article on Stalker locations, you can find it in our "Topics" or by clicking here. There will be a projection of Stalker at the MK2 Quai de Loire, on October 19. See this announcement. Radio Mayak carried an interesting interview with Andrei Tarkovski Jr. in 2002, wherein he also talks about the forthcoming Russian edition of the Diaries. Our archived copy of the audio file can be found here... [ the original URL is no longer working: http://www.radiomayak.ru/schedules/13/2137-audio.html ]. Radio Mayak also has an interview with Marina Tarkovskaya, here. All in Russian. Thanks to Michal Petricek for the pointers. Youtube.com now contains a large amount of Tarkovsky related material. Use, for example, the search terms Tarkovsky, Tarkovski, or Tarkovskij. On the lighter side, here is a remake of the candle sequence in Nostalghia — thanks to Gregory Runfeldt for the tip. Some additional Youtube clips of possible interest to our readers: Ingmar Bergman on the making of Saraband, Part I | Part II | Part IIII. 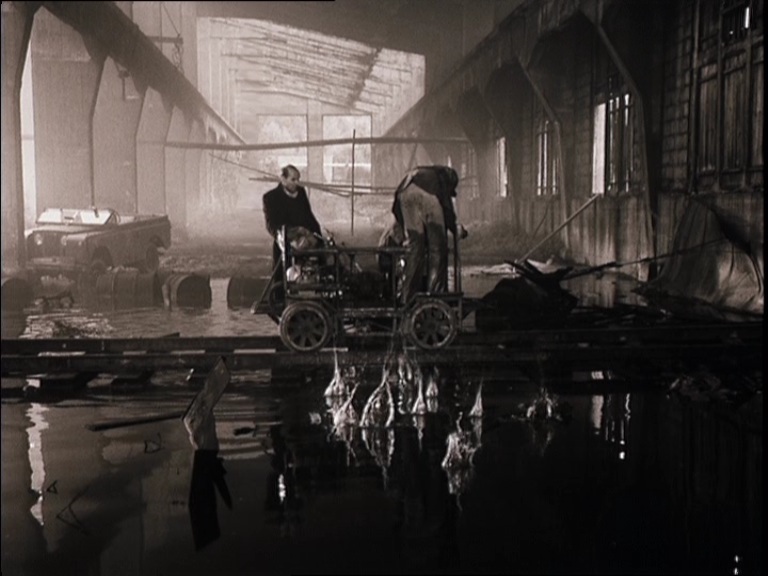 A favorite sequence from Bela Tarr's Sátántangó. Bela Tarr's Visions of Europe. The latest news update from Les Amis de l'Institut Andreï Tarkovski, Paris, can be found here [French, PDF]. It describes events in connection with the ongoing Tarkovski en France, 1986–2006 anniversary. Kino International have announced Stalker on DVD in North America (Region 1, NTSC). Street date is November 7, 2006. This appears to be the a RusCiCo product, similar if not identical to the 2002 Image Entertainment release. SRP is $29.95 (as opposed to the $49.95 price tag of the Image Entertainment DVD) [ cover scan ]. Some details of the forthcoming MK2 Nostalghia DVD can be found here, and the cover may be viewed here. Perhaps the worst Tarkovsky cover art ever? No mention of English subtitles. Thanks to Wayne Spencer for the links. For an announcement of Sven Nykvist's death, see our September 20 news update on the main mastersofcinema.org site... He will be sorely missed. Magnum Photos has a few Tarkovsky related photos taken by Gueorgui Pinkhassov. 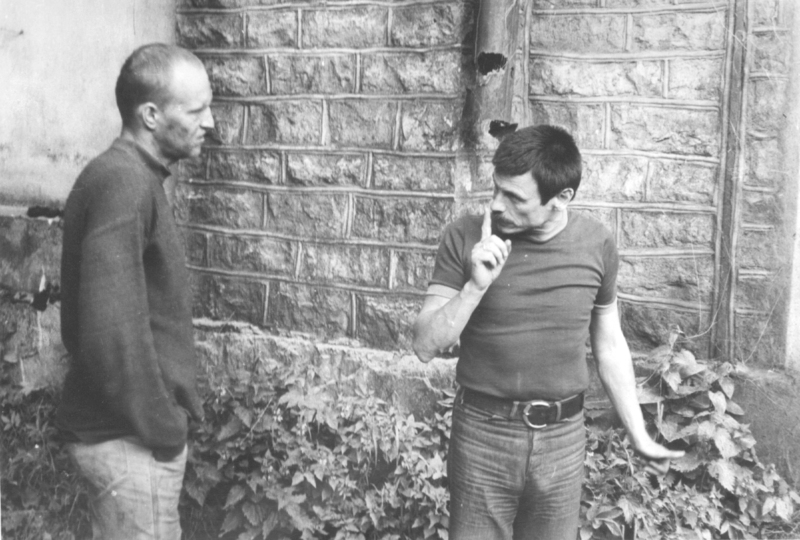 There is one photo of Tarkovsky and one of his father — follow this link. Thanks to site visitor Jozo Zovko for the pointer. The upcoming book Through the Mirror — Reflections on the Films of Andrei Tarkovsky (see earlier news items) now has its own webpage on the Publisher's site, here. To be published this fall (the publication date on the web page is wrong). 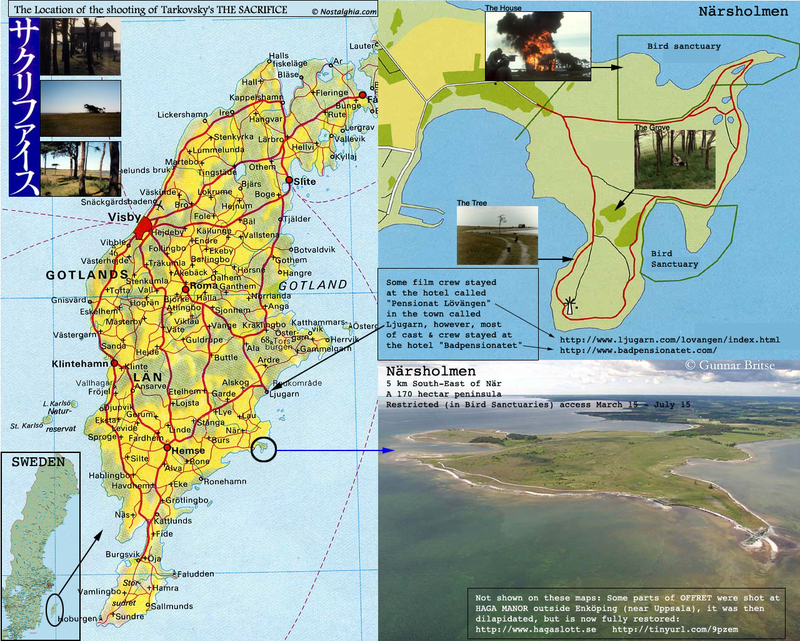 Several of the locations that were used in Stalker (and what they look like now) are shown on this Estonian website. Click on the pictures, and you'll be able to tell what shots they were in the film... Somebody please translate to English. Also check out this screenshot gallery of Tarkovsky's Stalker. Robert Bird's fine book on Andrei Rublev is now out in a Czech translation. Cover scan here [PDF]. 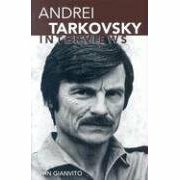 The publisher's page for the exciting new book Andrei Tarkovsky: Interviews is now also up, here. To be published this October. Wayne Spencer informs us that the Fall 2006 edition of Cineaste magazine includes the article A Second Look: Andrei Tarkovsky's "Nostalghia" by Dan Jones. See the table of contents here [PDF]. Those interested in pinhole cameras should also check out Camera Obscura 1–∞, a project co-founded by frequent site visitor and collaborator Burkhard Walther. Our own Masters of Cinema DVD Series received some encourgaing words in the latest issue of Premiere (October 2006), where Glenn Kenny starts an interesting new column entitled "Foreign Affairs". The column focusses on DVD releases in other regions (i.e., other than Region 1). A small excerpt: "[...] Eureka's Masters of Cinema line, for example, has quickly established itself as an across-the-pond answer to Criterion (even outdoing Criterion by offering a more complete version of the Japanese horror classic KWAIDAN, 20 minutes longer than the U.S. edition). Recent releases include John Ford's stupendous 1936 THE PRISONER OF SHARK ISLAND and a splendid edition of Murnau's FAUST. The label's packages are always handsome and extras well-considered and executed. [...] The exacting website DVD Beaver (dvdbeaver.com) keeps tabs on such foreign releases and is also informative on players...."
Also check out Jonathan Rosenbaum's latest DVD column for Cinemascope, here. 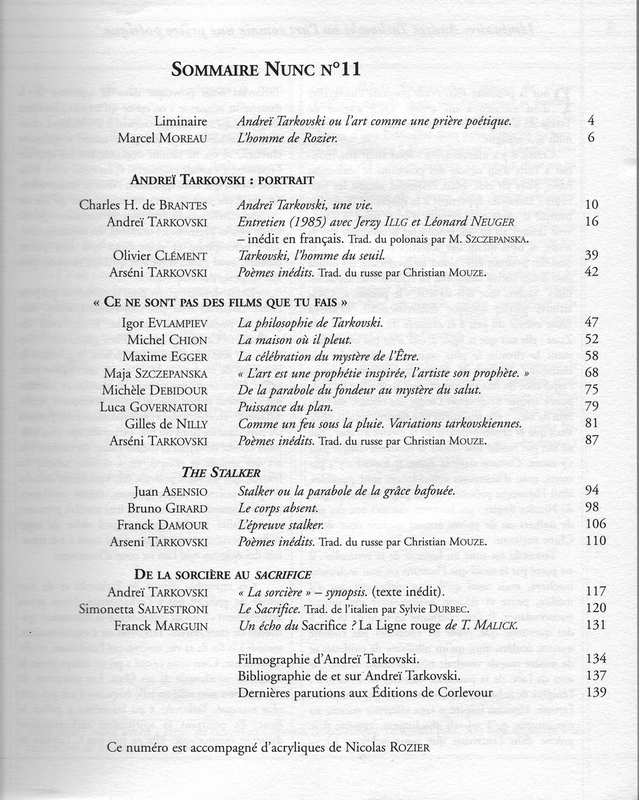 The latest news update from Les Amis de l'Institut Andreï Tarkovski, Paris is found here [French, PDF]. Please consider becoming a member of the Les Amis — the 2006 membership application form is here! Additional details on Couturier's Nostalghia — Song for Tarkovsky can be found on the ECM Records website (see their News/Coming Soon section). MK2 is planning to release Nostalghia on DVD in November. A copy of Michael McCormick's essay Model of a House has just landed on our newsdesk, and we are highly impressed. The publishing job was done on Lulu.com and the book is available at that site as well as through amazon.co.uk. The Czech 2xDVD Andrej Rublev has been released. More details here [ cover scan | disc art ]. I've been your reader long time — also a Tarkovsky's admirer. centenary (24th of Juny). You may see this news from here. 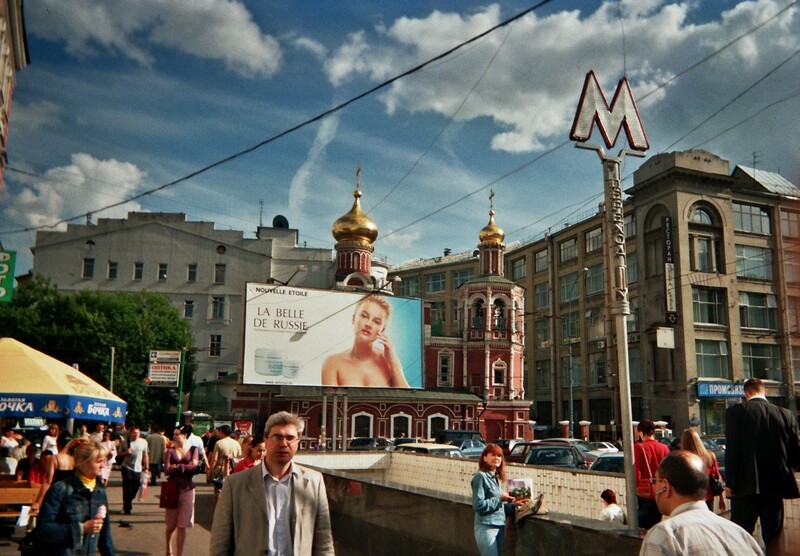 Shazina Gallery, Moscow, is hosting an exhibition of works by Shavkat Abdusalamov, July 6 to 30, 2006. Their website is here... check it out! See also the article Working with Andrei on Stalker. PS. A small correction to the previous news item: contrary to the description of the second edition of Tarkovsky i ya at Ozon.ru, the book has not been expanded. It has the same number of pages (487) although it has been reset — which results in minimal pagination variations between the two editions. The new edition also omits a few photographs and renders in black and white those originally in colour. 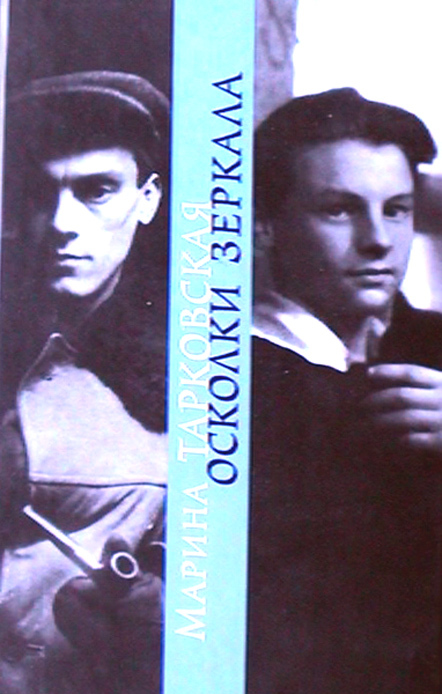 Two books from Russia have been reprinted in new, expanded editions: Tarkovski i ya (Tarkovsky and I) by Olga Surkova and Oskolki zerkala (Pieces of Mirror) by Marina Tarkovskaya. We haven't seen the new edition of Olga Surkova's book yet, according to Ozon.ru its page count is now up to 544 — that's about all we know at this point. The new edition of Marina Tarkovskaya's book has 35 new stories added along with more photographs and documents. The upcoming Czech Andrej Rublev DVD release is based on RusCiCo materials, but it will in fact contain the original mono soundtrack. English subtitles are included. We note that earlier RusCiCo-based releases of this title (AE, MK2, &c.) unfortunately did not contain the original mono soundtrack. For those of you who are planning to visit the location where much of The Sacrifice was shot, here is a helpful graphic which we prepared last summer but forgot to post (doh!). 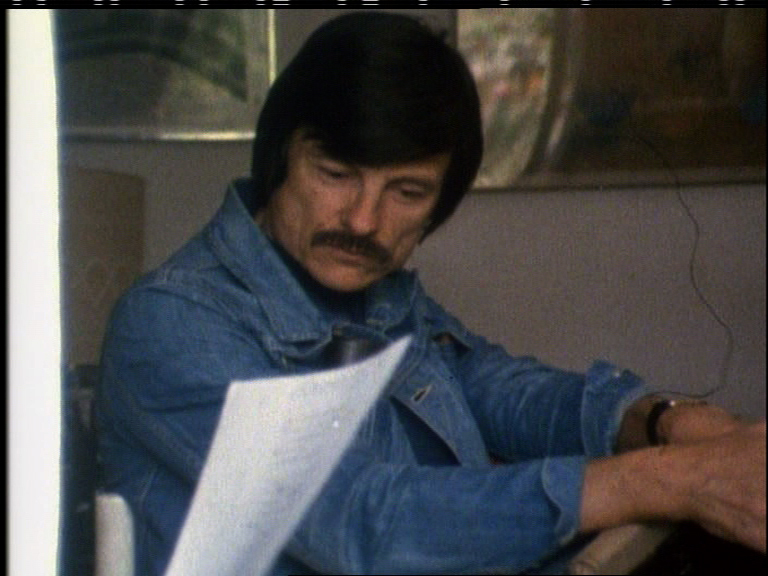 Site visitor Jacob Dijkstra has conducted some good detective work and located additional details on the upcoming book Andrei Tarkovsky: Interviews (Conversations with Filmmakers) mentioned in our May 17 update: namely, its Table of Contents. The book clearly fills an important gap in what is currently available in the English language. The Moskwood (Netherlands) release of Nostalghia has been delayed (again), this time until June 27. The Finnish Tarkovsky DVDs mentioned earlier appear to have been delayed until August 25. Site visitor Luca of Italy writes "hi, i'm an italian student. i've just completed my university studies and i've made my final thesis on Takovskij's Stalker, to give an homage to this great director. are you interested? the work is in italian, about 200 pages." Of course we're interested — we do have many Italian readers. So, Luca's thesis, LA FEDE NEL CINEMA — Analisi del film STALKER di Andrej Tarkovskij can be accessed here. Thanks, Luca! completely drops out. The defect also appears on the PAL (AE) version." The Lizard/BFI version seems more plausible to me. "We find all of this rather puzzling. Why would a company like RusCiCo, a company presiding over such an ambitious project as the release of hundreds of Russian film classics on the DVD within the next few years, be so careless when it comes to publishing some of the most carefully crafted works ever put on film? 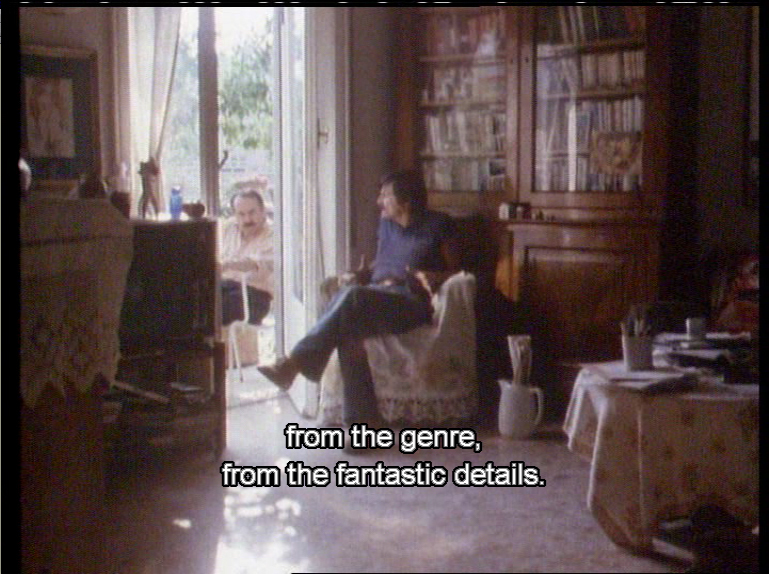 [...] It is well-known from Tarkovsky's interviews, from his books, from his friends, even from anecdotes, how meticulous he was about everything and how important every little sound or detail was to him. He would study how exactly the mud from the bottom of the pond raised before he decided where to film the short scene with the [Mirror] Narrator as a boy, swimming. He would listen for a difference between the sound of milk and water splashing on the floor. This is the sort of thing any would-be restorer of a Tarkovsky film should keep in mind. "Why is it that Arts other than Film have long-established traditions and specific procedures for publication of the old Masters, while people involved in publication of films behave as if none of this knowledge existed. Why do they insist on reinventing the wheel while Literature has its science of textual analysis from the holograph manuscript down to first editions; while researchers in the field of Classical Music know of a systematic approach toward producing an Urtext; while highly trained experts deduce which stroke of the paintbrush belongs to whom on a painting under restoration. Yet for some reason all this seems completely alien to the practice of film restoration, and the custodians of the original elements have no reservations about making them available to pretty much anybody: people whose only credentials are directions from their managers to do the work. Undoubtedly everybody involved means well but restoration of world class art is not just a hobby, it's a serious profession. "[...] [W]hat would the world say if the Louvre started repainting the Mona Lisa to make it more snappy, or some publisher came up with a rewritten and "more readable" edition of Proust's A la recherche...?" The publication of "definitive" editions of Tarkovsky's Martyrolog diaries (Italy 2003, France 2004) invited comparison with the Polish edition of 1998. The result of our small investigation using the French and the Polish editions has been added to the "Topics" section. In our opinion neither book can be considered a "definitive" or "critical" edition. There are many differences between them indicating inaccurate transcripts have been used as the basis for publication. Needless to say, for a truly critical edition the manuscript itself should be taken as the basis. Because of the differences and the small probability of a revised edition coming any time soon it's fair to say that both books complement one another and are both highly recommended (no English version is forthcoming, unfortunately). Now, proceed to our informal comparison. Sean Martin has written a short article on Andrei's Polaroids for the print edition of the current issue of Tank Magazine (www.tankmagazine.com). Moskwood, The Netherlands, have postponed the release of their Nostalghia (again), this time to May 30th. essay available [ here ] (the website is that of the NEW ZEALAND LISTENER). a marvellous site (and one I have only just discovered). Laura Geronazzo of ULTREYA wrote to remind us that the Tarkovsky Polaroids book has now been released in North America as well [ amazon.com ]. Paperback only, this time. 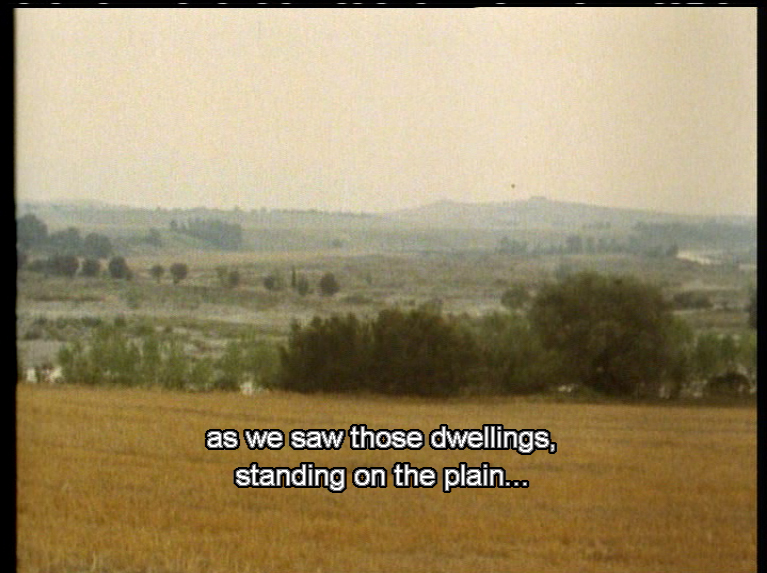 endless wonder when I first discovered Tarkovsky. by Cinemaseekers as "a masterpiece", "one of the best films I have ever seen". One of the few survivors of Stalker, sound designer Vladimir Ivanovich Sharun passed away on April 12. April 4th was what would have been Andrei's 74th birthday. Our correspondent Yevgeny Borzov in Ivanovo sent us the following report. Shuya State Pedagogical University (Ivanovo Region). Marina Tarkovskaya's book Oskolki Zerkala. by A. 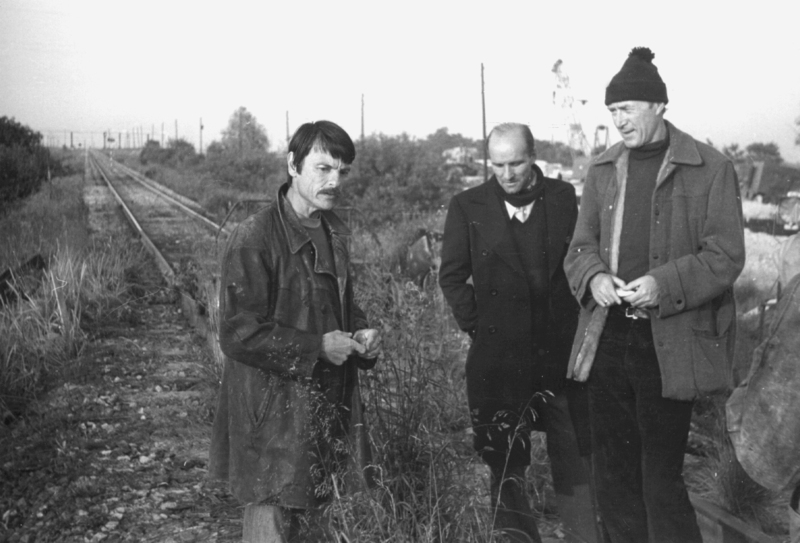 A. Tarkovsky (1996), Stalker's Dreams by Y.
Manuele Cecconello of Italy wrote to tell us about a beautiful new book on Andrei Tarkovsky. It is by Simonetta Salvestroni and it concerns itself with the traditional and spiritual roots of Tarkovsky's works. 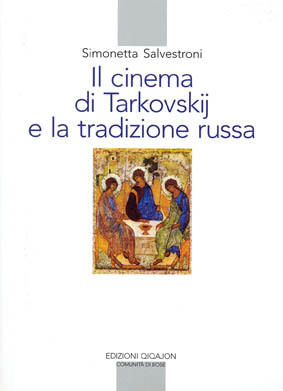 Publication information: Il cinema di Tarkovskij e la tradizione russa (Tarkovskij cinema and Russia tradition), ISBN: 88-8227-194-3; 280 pages; dimensions (in cm): 14,5 x 20,5; Edizioni Quiqajon — Comunità di Bose (www.monasterodibose.it). We are looking for the following documentary: GEORGY RERBERG. REJECTED "STALKER" BY TARKOVSKY. 2004. Directed by Marina Dubrovina, 104 min. Please contact newsdesk if you know where a copy may be obtained. 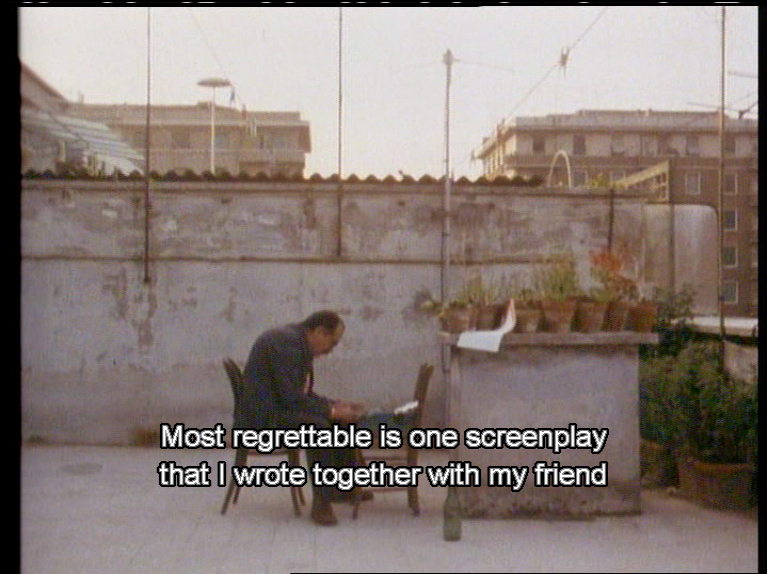 Dear Nostalghia.com. I wrote to you a year ago about a book I was editing on Tarkovsky. I just wanted to let you know that the text of the book, "Through the Mirror — Reflections on the films of Andrei Tarkovsky", is ready and has been sent to the publishers (Cambridge Scholars Press). It should be published within a half a year. Below are the blurbs and the table of content. The authors of this book are from various countries and have diverse educational backgrounds but they are united by one common thing; their love of Andrei Tarkovsky's films. Tarkovsky is one of the greatest film directors of all time and the most famous Soviet film maker since Eisenstein. He died of lung cancer in Paris 28th December 1986, only 54 years of age. This year, 2006, therefore marks the 20th anniversary of his passing. This is most likely the broadest volume on Tarkovsky, spanning everything from classical film theories to theological analyses, via sociology and the history of the ANS synthesizer. It is divided into two parts. The first part is called Film Theories and, as the name suggests, contains papers that touch more or less on film theories. Benjamin Halligan and Terence McSweeney write about Tarkovsky's aesthetic strategies and film theory. Sean Martin writes about the autobiography in Tarkovsky's films, David Beer about the music in Solaris, Oddny Sen analyzes dream-symbolism in the films with an emphasis on Ivan's Childhood and Paul Johnson looks at Tarkovsky's films from a sociological perspective. The second part of the book concentrates on theological themes in Tarkovsky's films. This kind of approach has been seriously neglected by most books and papers written about his films until now. Two of the papers in this part are general in nature. Torsten Kälvemark writes about the philosophical and theological understanding of Andrei Tarkovsky's work and Astrid Söderbergh Widding analyzes what's between the visible and invisible in the films of Tarkovsky. The remaining five papers concentrate on specific films, namely, Ivan's Childhood, Andrei Rublev, Stalker, Nostalgia and The Sacrifice. 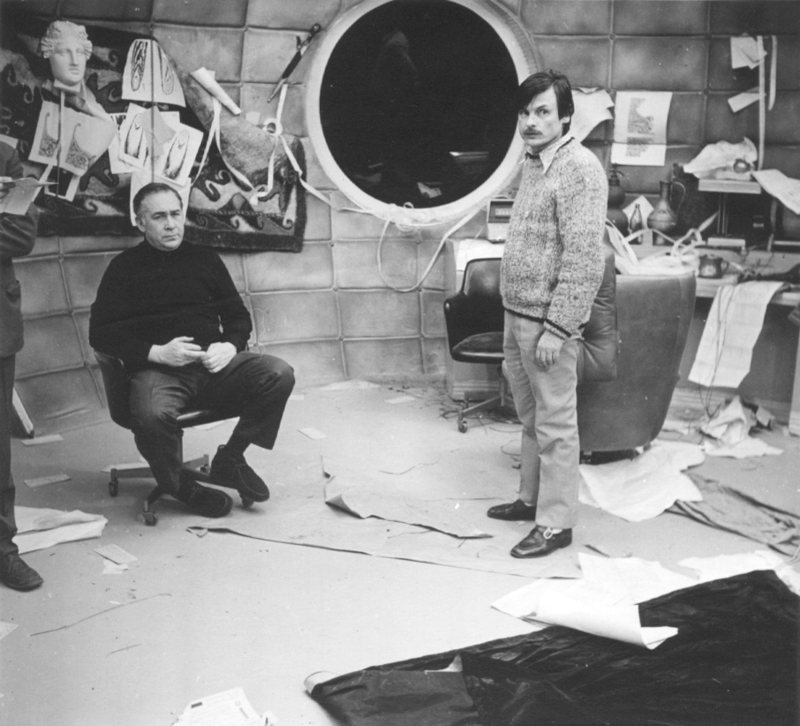 Tarkovsky frequently invited the audience to interpret his films as they saw fit. The authors of the papers in this book have all accepted Tarkovsky's invitation. About the Editors: Gunnlaugur A. Jónsson is professor of Old Testament Studies at the University of Iceland since 1995. He received a doctoral degree in theology from the University of Lund, Sweden, with the dissertation The Image of God: Genesis 1:26-28 in a Century of Old Testament Research (1988). Þorkell Ágúst Óttarsson has a B.A. degree in theology and is working on his M.A. thesis within the field of theology and film. He has written books and papers in Icelandic on religion and theological themes in films, i.e. on theological themes in war films. "With reference to our pleasant telephone conversation ... please find enclosed my copy of Stalker for your perusal. As I mentioned on the phone, I'm not actually sure that anything is wrong (! ), but the picture seems distinctly peculiar. The only way I can really explain it in words is by using the idea that there appears to be two pieces of film gliding over each other, one with background materials, the other with the lighter foreground elements. In the opening scene (Chapter 2, "Stalker's home") where a door is gradually opening revealing sleeping figures in bed, the white of the bedclothes, end of the bed and the bedroom furniture, plus the window-frame to the right, seem to be juddering compared to the darker background elements in the room. This is not only because there is some natural vibration (e.g. in the water in the jug) a little later in the scene from a train passing by. You can also see this at ca. 5 mins. 38 secs./5 mins. 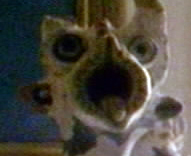 40 secs., where a close-up of the head of one of the characters shows a momentary distortion in his "frown lines" when the camera pans across. I wondered whether this was something peculiar to the sepia/black/white elements in the film, but it also seems to happen in the colour sequences. For example, in Chapter 6 "Starting out on the path" at ca. 46 mins. 39 secs to 46 mins. 53 secs. the railway line in the bottom quarter of the picture seems to be flickering up and down. Surely this cannot be right? Awaiting your verdict with interest." "Many thanks for sending me your DVD of Stalker and your very helpful letter which detailed the problems you had encountered with the DVD. I have looked into the issue and have compared your DVD with a number of other DVDs and VHS copies of the film, including the master copy. It seems that as strange as the effect appears, it is in fact deliberate. I have done a little research into the matter and it seems that Tarkovsky employed a technique whereby he would place one layer of film on top of another and move them, thus creating this de-stabilising effect. I hope that your viewing of the film will be enhanced by the knowledge that the look of the film is very much intentional." then perhaps the "jitter/float" seen in the DVD should be there." Artificial Eye are clearly talking out of their gluteus maximus again. 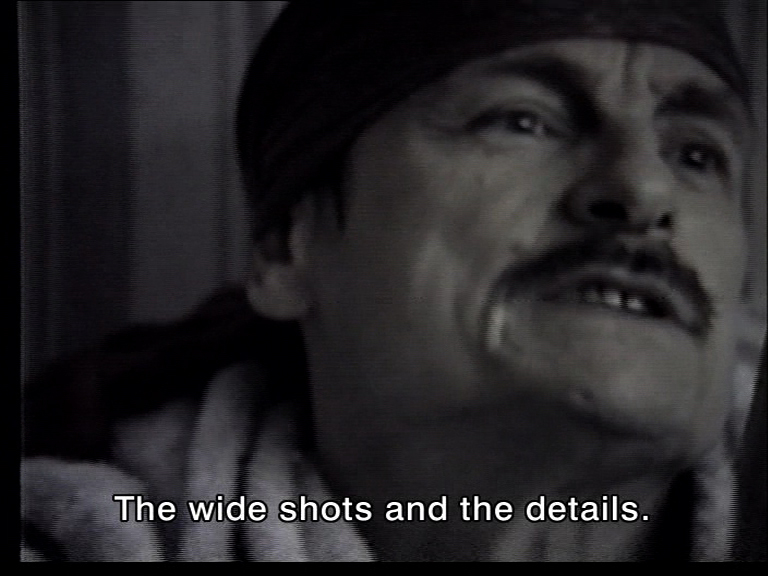 Are they saying that Tarkovsky "deliberately and carefully manipulated one layer of film on top of another" on the close-up of Solonitsyn's face in order to cause his cheek and ear to move independently of his face? Ludicrous. We have prepared a video clip which clearly and unambiguously shows that the effect is, as has been pointed out here numerous times, an (unnecessary) artifact of the video compression scheme used. We digitized a portion of the "Stalker's home" sequence as found on the Fox Lorber VHS (which of course exhibits no digital jitter whatsoever) and ran it through the default AVI compression in iMovie—the result was an effect identical in every respect to what is seen in the AE/RusCiCo DVD. The URL to our video clip, which shows the uncompressed and compressed sequences back-to-back, is available upon request (it's rather large, about 50 MB). We find Artificial Eye's bold-faced attempt at deceiving one of their more intelligent and quality aware customers totally unacceptable. The production design exhibit at the Academy houses a treat for Tarkovskyphiles—the original scale model of the house seen in The Sacrifice. It's in a glass case on a pedestal, so you can walk around it and study it from all angles. The exhibit ends April 16. (See also our Sacrifice Special Section). The paperback version of Instant Light is now up on the publisher's website. Sean Martin's book on Andrei Tarkovsky will be published very shortly (likely January or February). Updated release information and other details can be found here. A preview copy of the book has landed on our newsdesk. This unassuming-looking 258-page pocket reference book contains a staggering wealth of information on all things Tarkovsky, from his full-length films to the lesser-known works for TV, radio, and stage, including film school works and unrealized projects. There are illuminating pieces of trivia found in here that have to our knowledge never before been published in English. Each of Tarkovsky's 7.5 films are carefully discussed in terms of storyline, production history ins and outs (the knowledge it took us years to acquire is all laid out here), and other thematic elements pertinent to the particular film being discussed. In his introduction, Mr. Martin writes, "My approach has [...] been only partially concerned with analysis, as I feel that the inherent mystery of Tarkovsky's films speak for itself, and the films are, ultimately, not solvable. They are films that change as we do." Mr. Martin has really nailed it with this book, and no Tarkovsky collection is complete without it. Use this purchase link to support DVDBeaver.com. While on the topic of indispensable Tarkovsky related books, let us not forget to mention Robert Bird's Andrei Rublev. A highly readable book, and currently the most complete English-language treatment of the film, its historical context, and its turbulent production history. Scene-by-scene differences between The Passion According to Andrei and Andrei Rublev are discussed in great detail, and it finally becomes evident (in our opinion) which version Tarkovsky actually preferred. There is much insight packed into these 90 pages... a couple of teasers: "Like Bresson, Tarkovsky made his films an exercise in depicting the invisible, which can only take shape beyond the frame through the agency of the viewer. The basis of this innovatory style is the use of the camera to suspend the event in the act its being regarded by others, which undermines the subject's sovereign viewpoint [...]". (pg 68). "Just as a remembered dream sometimes ends with the event which logically caused it (e.g., a dreamed crime culminating in a police siren which turns out to belong to a police car wailing outside your window), so also the icon is a space in which time can flow backwards from effect to cause. There are just such reversals in Andrei Rublev. The most tantalizing example is the crucifixion sequence in episode two: [...]" (pg. 77). This is an important work, and the book comes highly recommended. Recent additions to our Topics' section include David Wishard's An Attempt at Universal Subjectivity, and Greg Polin's Stalker's meaning in terms of temporality and spatial relations. The Kai Grehn radio drama adaptation of Hoffmanniana is being broadcast on WDR3 on January 25th. Additional details can be found here. Nostalghia.com owns a CD-copy of the earlier SWR2 broadcast of this Hörspiel and can vouch for its production value [ brief excerpt ]. (Incidentally, we never were able to obtain a copy of Hanna Kulenty's Hoffmanniana, nor Thomas Dezsy's Hoffmanniana). The paperback version of the English edition of Instant Light is being released this month in the U.K. Details can be found, e.g., here. The Artificial Eye version of Mirror is currently available for less than GBP 8, here. (If you should order it and receive the version which does not include the original Mono audio track, contact us here at newsdesk for product exchange instructions). Avoid Artifical Eye's version of Ivan's Childhood, also on sale. Currently, the only acceptable version is the MK2 version (see earlier news updates). However, we recently received a screener of RusCiCo's own Ivan's, directly from RusCiCo in Moscow, and this disc actually contained a version of the film identical to that used by MK2. It would appear that the bad version has sold out, and that the new transfer is in the process of entering circulation (unconfirmed). 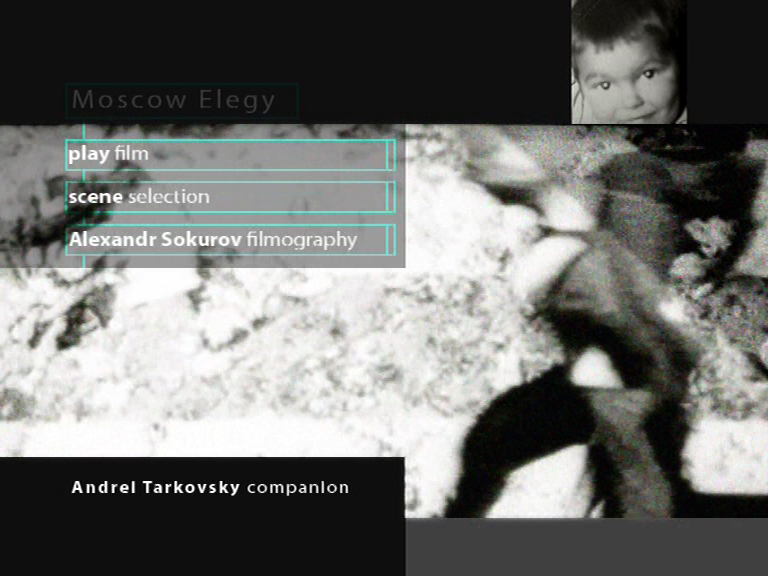 Still no news on the Artificial Eye Andrei Tarkovsky Companion DVD mentioned in our March 10, 2005 update. The word from AE is still "No exact date yet — some time later this year". We shall keep you posted. The recent German Tarkovsky DVD Box set has dropped in price from 60 to 30 Euros. More information here. Nostalghia and Sacrifice are not included in the 5xDVD set. Site visitor Christoph Endres reports that the bonus materials consist of text biographies and filmographies (identical on all five discs), and that there is a video introduction to each film — in the case of Stalker, for instance, there is a 15 minute reflection by the D.P., and on the Solaris disc there is an approximately 30 min feature called "Solaris" as the basic question of philosophy. Solaris and Rubljow are presented in 1.85:1 aspect ratio, non-anamorphic. The rest is presented in 4:3. The only audio track is German mono, i.e., there is no original audio included — we here at Nostalghia.com therefore recommend that you avoid this box set. Additional details on the French Sacrifice 2xDVD release from ARTE [ cover ] can be found here. Stalker is being released on DVD in the Czech Republic in February. This will be the RusCiCo 2xDVD set, with original mono soundtrack. The film is Czech subtitled, and so is an interview with Knazinsky, Artemyev and Safiulin. The cover art will be Czech original. The DVD set will be released by Zona in collaboration with Aerofilms, who also own the rights for the Slovak Republic. Czech readers can find more information here.